Relegated Sunderland ended a miserable season in the Championship by thumping champions Wolves, who missed out on the chance to top 100 points. Ovie Ejaria tapped Sunderland ahead and Ashley Fletcher lobbed in the second over on-rushing Wolves keeper Will Norris after holding off Danny Batth. Paddy McNair cut into the box and drilled in the third to seal victory. Sunderland are the only team not beaten by Wolves in the league this season, following December's draw at Molineux. 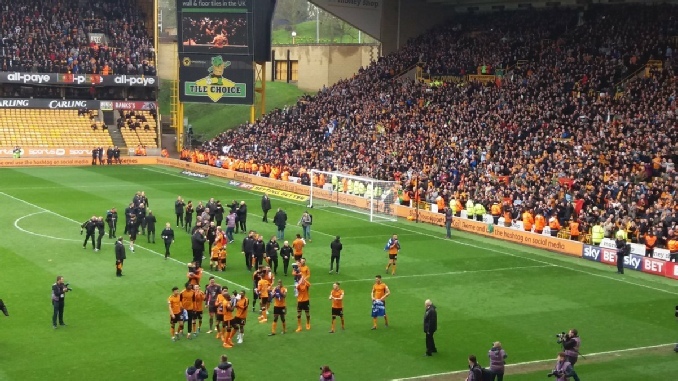 Wolves, who lifted the Championship trophy last weekend, finish the season with 99 points, a record for the Molineux club in the second tier. Sunderland ended the game with six academy players on the pitch at the Stadium of Light, with 20-year-old Luke Molyneux having made his first senior start and Elliot Embleton, Denver Hume and Bali Mumba all coming off the substitutes' bench in the second half. "It made me proud that some of them were lads that came through the youth system when I was coaching there. It was a proud moment for the football club. There's a lot of hard work that goes into developing young players, and there would have been more involved if they were fit. But I've got to say that although I was really proud, and although it was a really good moment for the club, the attitude of the loan players and the senior players was also really good. The environment they created was great. John O'Shea epitomises what a professional footballer should be. His brilliance around the training ground, and on the pitch he's always organising. The mix of senior and younger players was really good." "It was a bad game. We were not as intense as we should have been, and that is why we lost. A lot of things have been happening, and we were promoted a long time ago. We wanted to push for a victory and our fans were there, but the game did not go well. It is not a question now of looking at it too deeply, although we should have done better. I cannot take anything away from my boys though. What they have achieved is fantastic. We have finished as champions and we did everything that we wanted to. They should all be very proud." 90'+2' Second Half ends, (S) 3, Wolverhampton Wanderers 0. Second Half begins Sunderland 2, Wolverhampton Wanderers 0. 45'+1' First Half ends, (S) 2, Wolverhampton Wanderers 0. Goal! 45' Goal! 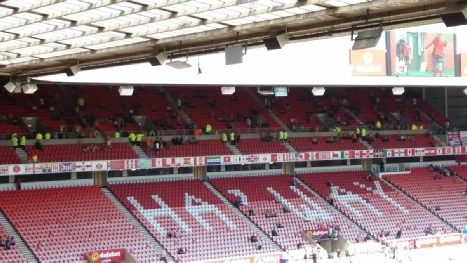 Sunderland 2, Wolverhampton Wanderers 0. Ashley Fletcher (S) right footed shot from the left side of the box to the top left corner. Assisted by Ethan Robson. 40' Foul by Hélder Costa (WW). 40' Bryan Oviedo (S) wins a free kick on the left wing. 39' Attempt missed. Rúben Neves (WW) right footed shot from outside the box is too high. Assisted by Morgan Gibbs-White. 37' Offside, (WW) Roderick Miranda tries a through ball, but Diogo Jota is caught offside. 36' Attempt missed. Bryan Oviedo (S) left footed shot from the left side of the box misses to the right. Assisted by Luke Molyneux. 36' Attempt blocked. Paddy McNair (S) right footed shot from outside the box is blocked. Assisted by Ashley Fletcher. 35' Corner, (WW) Conceded by Marc Wilson. 33' Foul by Roderick Miranda (WW). 33' Ashley Fletcher (S) wins a free kick in the attacking half. 33' Foul by Paddy McNair (S). 33' Barry Douglas (WW) wins a free kick in the defensive half. 32' Adam Matthews (S) wins a free kick in the defensive half. 32' Foul by Diogo Jota (WW). 29' Attempt saved. Ovie Ejaria (S) right footed shot from outside the box is saved in the bottom right corner. 28' Bryan Oviedo (S) wins a free kick in the attacking half. 28' Foul by Romain Saiss (WW). 28' Attempt blocked. Ashley Fletcher (S) right footed shot from the left side of the box is blocked. Assisted by Paddy McNair. 25' Attempt saved. Ashley Fletcher (S) right footed shot from outside the box is saved in the top centre of the goal. Assisted by Ethan Robson. 25' Paddy McNair (S) wins a free kick in the attacking half. 25' Foul by Roderick Miranda (WW). 24' Ashley Fletcher (S) wins a free kick in the attacking half. 24' Foul by Danny Batth (WW). Goal! 19' Goal! Sunderland 1, Wolverhampton Wanderers 0. Ovie Ejaria (S) right footed shot from very close range to the centre of the goal. 19' Attempt saved. Luke Molyneux (S) right footed shot from the centre of the box is saved in the centre of the goal. Assisted by Paddy McNair with a cross. 18' Hand ball by Ethan Robson (S). 17' Corner, (S). Conceded by Romain Saiss. 17' Attempt blocked. Paddy McNair (S) right footed shot from outside the box is blocked. Assisted by Joel Asoro. 16' Attempt missed. Joel Asoro (S) right footed shot from the right side of the six yard box is close, but misses to the right. Assisted by Paddy McNair with a cross. 12' Corner, (S). Conceded by Will Norris. 12' Attempt saved. Ovie Ejaria (S) right footed shot from outside the box is saved in the top centre of the goal. Assisted by Luke Molyneux. 11' Corner, (S). Conceded by Barry Douglas. 10' Attempt blocked. Joel Asoro (S) left footed shot from the centre of the box is blocked. Assisted by Luke Molyneux. 10' Attempt missed. Luke Molyneux (S) left footed shot from the centre of the box misses to the right. Assisted by Bryan Oviedo with a cross. 10' Attempt blocked. Luke Molyneux (S) left footed shot from the centre of the box is blocked. Assisted by Bryan Oviedo. Robbie Stockdale will take charge of relegated Sunderland against champions Wolves following manager Chris Coleman's exit on 29 April. Winger Aiden McGeady (heel) is again likely to miss out for the Black Cats, who are certain to finish bottom. Wolves are unlikely to risk winger Ivan Cavaleiro, who has missed their past two games with a hamstring problem. A victory for Wolves would mean they have beaten every team in the Championship at least once this season. SAM, the Sports Analytics Machine, is a super-computer built by @ProfIanMcHale of the University of Liverpool. The Black Cats are winless in their past six league matches against Wolves (D2 L4). These sides have not met at the Stadium of Light since April 2012, a goalless draw in the Premier League. Sunderland have lost eight of their past 10 final league matches of a season (W1 D1) with one of those defeats by Wolves in 2009-10. Wolves, meanwhile, have won their final league match of a season in each of the past four seasons since losing 2-0 to Brighton in 2012-13. No Championship side has lost more points from winning positions than the Black Cats (28). A Wolves win would see them hit 102 points for the season and be the first side since Leicester City (also 102) in 2013-14 to win more than 100 points in a season in the Championship. Ruben Neves has scored six goals from outside of the box this season - two more than any other player in the division. Sheffield Wednesday held Championship title-winners Wolves to a goalless draw at a drizzly Molineux. In a first half of few chances Wolves came the closest through Benik Afobe's low shot from an acute angle and Romain Saiss's close-range header. The hosts almost took the lead from the restart through two Diogo Jota low strikes and Danny Batth's header. The Owls showed little in attack but denied Wolves a fifth successive win prior to lifting the league trophy. 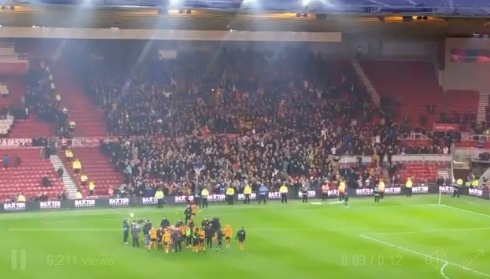 The Molineux side had already wrapped up the Championship title going into the game, after their 4-0 win against Bolton last time around, but they struggled to convert chances against a Sheffield Wednesday side that could not get into the game. The result means Wolves - on 99 points - will have to wait until their trip to relegated Sunderland on the last day of the season if they are to cross the 100 mark for the second time in five seasons. Nuno Espirito Santo's side could become only the fifth team to cross into a century of points in the second tier after Fulham in 2000-01 (101), Newcastle United in 2009-10 (102), Sunderland in 1998-99 (105) and Reading in 2005-06 (106). A goalless stalemate against Wednesday, who dropped to 15th, also means that Wolves cannot beat their record points haul of 103 in League One in 2013-14. Sheffield Wednesday manager Jos Luhukay: "Over 90 it was a good game from us, good defending, we had good stability and played good football. We came here with a lot of confidence and I am satisfied with our work against the best team in the league. I'm very happy with the progression we have made over the last two and a half months." Match ends, Wolverhampton Wanderers 0, Sheffield Wednesday 0. Full Time 90'+1' Second Half ends, Wolverhampton Wanderers 0, Sheffield Wednesday 0. 89' Offside, (WW) Morgan Gibbs-White tries a through ball, but Romain Saiss is caught offside. 89' Foul by Joey Pelupessy (SW). 89' Bright Enobakhare (WW) wins a free kick in the defensive half. 87' Sub, (WW) Morgan Gibbs-White replaces Diogo Jota. Booking 83' Romain Saiss (WW) is shown the yellow card for a bad foul. 83' Fernando Forestieri (SW) wins a free kick in the attacking half. 83' Foul by Romain Saiss (WW). 82' Fernando Forestieri (SW) wins a free kick in the defensive half. 82' Foul by Bright Enobakhare (WW). 79' Foul by Atdhe Nuhiu (SW). 79' Danny Batth (WW) wins a free kick in the defensive half. 79' Attempt missed. Bright Enobakhare (WW) right footed shot from the right side of the box misses to the left. Assisted by Léo Bonatini with a through ball. 76' Corner, (WW) Conceded by Jordan Thorniley. 75' Corner, (WW) Conceded by Jordan Thorniley. 75' Attempt blocked. Romain Saiss (WW) left footed shot from the centre of the box is blocked. Assisted by Diogo Jota. 74' Sub, (WW) Bright Enobakhare replaces Hélder Costa. 61' Attempt missed. Rúben Neves (WW) right footed shot from outside the box is high and wide to the right. Assisted by Hélder Costa. 60' Sub, (SW) Marco Matias replaces Lucas João. 59' Lucas João (SW) wins a free kick on the left wing. 59' Foul by Romain Saiss (WW). 58' Corner, (SW) Conceded by Barry Douglas. 57' Attempt blocked. Rúben Neves (WW) right footed shot from outside the box is blocked. Assisted by Hélder Costa. 55' Sub, (WW) Léo Bonatini replaces Benik Afobe. 51' Foul by Atdhe Nuhiu (SW). 51' Rúben Neves (WW) wins a free kick in the defensive half. 49' Offside, (SW) Atdhe Nuhiu tries a through ball, but Fernando Forestieri is caught offside. 48' Attempt missed. Danny Batth (WW) header from the centre of the box misses to the right. Assisted by Hélder Costa with a cross following a corner. 48' Corner, (WW) Conceded by Cameron Dawson. 48' Attempt saved. Diogo Jota (WW) right footed shot from outside the box is saved in the centre of the goal. Assisted by Romain Saiss. 46' Corner, (WW) Conceded by Cameron Dawson. 46' Attempt saved. Diogo Jota (WW) left footed shot from the left side of the box is saved in the bottom left corner. Assisted by Hélder Costa with a through ball. Second Half begins Wolverhampton Wanderers 0, Sheffield Wednesday 0. Half Time 45'+2' First Half ends, Wolverhampton Wanderers 0, Sheffield Wednesday 0. Championship title-winners Wolverhampton Wanderers can pass 100 points if they beat Sheffield Wednesday at Molineux on Saturday. Ivan Cavaleiro is a doubt after picking up a hamstring strain while defender Ryan Bennett has sustained a knock. Wednesday defender Jack Hunt will miss the final two games of the campaign with a knee injury. Lucas Joao and Atdhe Nuhiu may start after coming off the bench in the 3-0 win against Reading on 21 April. Keiren Westwood (groin), Joost van Aken (ankle), Morgan Fox (hamstring), Sam Hutchinson (hernia) and Gary Hooper (hip) all remain sidelined for the Owls. who cannot finish higher than 12th in the Championship. Wolves, currently on 98 points, would still have one final chance to break the century barrier when they travel to Sunderland for the last game of the season. Wolves have won five of their last six home league games against Sheffield Wednesday (L1) - however, that one defeat was in last season's fixture. The Owls have failed to score in seven of their last 10 league meetings with Wolves (W2 D2 L6). Wolves have scored at least two goals in each of their last eight league games at home, netting 19 times and conceding just six (W6 D2). Sheffield Wednesday have won three of their last four league games on the road (L1), as many as in their previous 18 in the Championship. Ruben Neves has bagged four goals from outside the box in 2018, more than any other Championship player. In fact, only Coventry's Marc McNulty (5) has netted more from outside the box since the turn of the year. Since returning to the side, Fernando Forestieri has bagged three goals in his last three starts for the Owls. 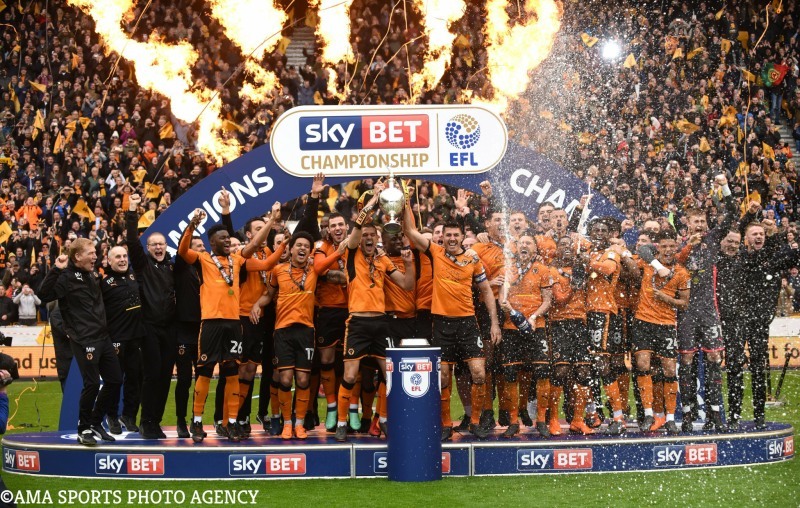 Wolverhampton Wanderers sealed the 2017-18 Championship title in style as they swept aside relegation-threatened Bolton Wanderers. Needing just a point to win the title, Barry Douglas struck on the rebound to put the visitors in front early on. Conor Coady teed up Benik Afobe to find the net for Wolves' second before Diogo Jota chipped in to extend their lead. After Karl Henry brought down Afobe, Wolves defender Coady scored from the spot to wrap up a comfortable victory. 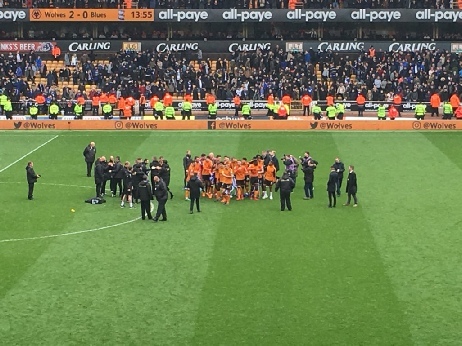 Victory for Nuno Espirito Santo's side means Wolves win their second Championship title in the past 10 years after they also won the second tier in 2008-09. 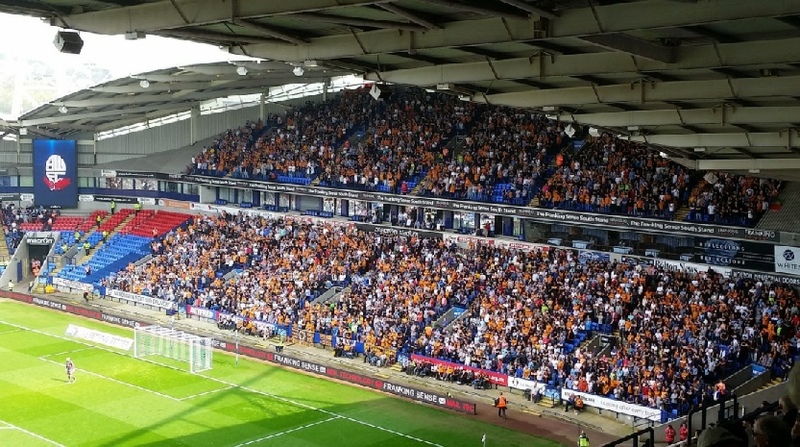 With six points still to play for, the win at the Macron Stadium leaves Wolves with a possible points total of 104, which would be the biggest haul in the Championship since Reading's record-breaking 2005-06 total of 106. Having passed the 80-goal mark this season when Afobe slotted in, Wolves continued to press, with Coady's second-half penalty meaning every regular outfield Wolves player has now scored this term. Bolton remain two points clear of the relegation zone after third-from-bottom Barnsley were beaten by Leeds United. Barnsley have a game in hand on Bolton, however, which they play against Nottingham Forest on Tuesday. Match ends, Bolton Wanderers 0, Wolverhampton Wanderers 4. 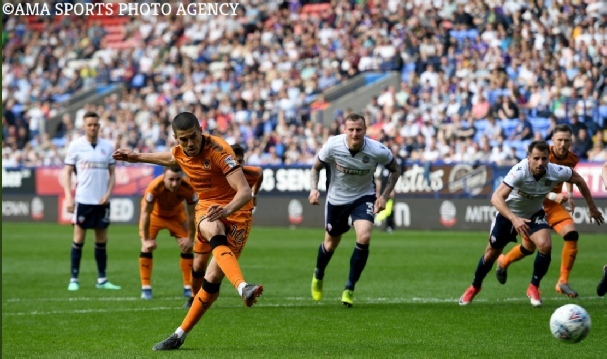 Full Time 90'+4' Second Half ends, Bolton Wanderers 0, Wolverhampton Wanderers 4.
sub, (BW) Zach Clough replaces Adam Le Fondre. 79' Morgan Gibbs-White (WW) wins a free kick. 79' Foul by Jon Flanagan (BW). 76' Matt Doherty (WW) wins a free kick in the defensive half. 76' Foul by Filipe Morais (BW). 71' Danny Batth (WW) wins a free kick in the defensive half. 71' Foul by Sammy Ameobi (BW). 68' sub, (WW) Léo Bonatini replaces Benik Afobe. 68' sub, (WW) Morgan Gibbs-White replaces Diogo Jota. Goal! Bolton Wanderers 0, Wolverhampton Wanderers 4. Conor Coady (WW) converts the penalty with a right footed shot to the bottom left corner. 65' sub, (BW) Craig Noone replaces William Buckley. 65' Penalty Wolverhampton Wanderers. Benik Afobe draws a foul in the penalty area. 65' Penalty conceded by Karl Henry (BW) after a foul in the penalty area. 65' Attempt blocked. Benik Afobe (WW) right footed shot from the centre of the box is blocked. Assisted by Hélder Costa 63' Attempt blocked. David Wheater (BW) header from very close range is blocked. Assisted by Filipe Morais with a cross. 63' Corner, (BW) Conceded by Rúben Neves. 62' Attempt missed. Benik Afobe (WW) header from the centre of the box is close, but misses to the left. Assisted by Barry Douglas with a cross following a corner. 61' Corner, (WW) Conceded by Mark Beevers. 61' Attempt blocked. Benik Afobe (WW) right footed shot from a difficult angle on the right is blocked. Assisted by Diogo Jota. 60' Attempt missed. Benik Afobe (WW) right footed shot from the centre of the box is close, but misses to the right. Assisted by Matt Doherty. 58' sub, (BW) Josh Vela replaces Darren Pratley. 57' Attempt missed. Rúben Neves (WW) right footed shot from outside the box is close, but misses the top left corner from a direct free kick. Booking 56' David Wheater (BW) is shown the yellow card for a bad foul. 56' Diogo Jota (WW) wins a free kick in the attacking half. 56' Foul by David Wheater (BW). 55' Offside, (WW) Matt Doherty tries a through ball, but Benik Afobe is caught offside. 55' Attempt blocked. Adam Le Fondre (BW) left footed shot from the centre of the box is blocked. Assisted by David Wheater. 54' Danny Batth (WW) wins a free kick in the defensive half. 54' William Buckley (BW) wins a free kick on the left wing. Goal! Bolton Wanderers 0, Wolverhampton Wanderers 3. Diogo Jota (WW) right footed shot from the centre of the box to the centre of the goal. Assisted by Hélder Costa with a through ball. 50' Diogo Jota (WW) wins a free kick in the defensive half. 50' Foul by Adam Le Fondre (BW). 50' Danny Batth (WW) wins a free kick in the defensive half. 50' Foul by Sammy Ameobi (BW). 48' Offside, (WW) Romain Saiss tries a through ball, but Hélder Costa is caught offside. 47' Attempt missed. Filipe Morais (BW) right footed shot from outside the box is just a bit too high from a direct free kick. Booking 46' Danny Batth (WW) is shown the yellow card for a bad foul. 46' Foul by Danny Batth (WW). 46' Adam Le Fondre (BW) wins a free kick in the attacking half. Second Half begins Bolton Wanderers 0, Wolverhampton Wanderers 2. Half Time 45'+3' First Half ends, Bolton Wanderers 0, Wolverhampton Wanderers 2. 45'+2' Foul by Willy Boly (WW). 45'+2' Sammy Ameobi (BW) wins a free kick on the right wing. Goal! Bolton Wanderers 0, Wolverhampton Wanderers 2. Benik Afobe (WW) right footed shot from the right side of the box to the bottom left corner. Assisted by Conor Coady. 45' Attempt saved. Hélder Costa (WW) left footed shot from outside the box is saved in the bottom right corner. Assisted by Diogo Jota. 44' Matt Doherty (WW) wins a free kick on the right wing. 44' Foul by William Buckley (BW). 41' Foul by Romain Saiss (WW). 41' Darren Pratley (BW) wins a free kick in the defensive half. 41' Rúben Neves (WW) wins a free kick in the defensive half. 41' Foul by Antonee Robinson (BW). 34' Attempt saved. Hélder Costa (WW) left footed shot from the right side of the six yard box is saved in the centre of the goal. Assisted by Diogo Jota. 32' Foul by Danny Batth (WW). 32' Darren Pratley (BW) wins a free kick in the defensive half. 32' Attempt blocked. Diogo Jota (WW) header from the centre of the box is blocked. Assisted by Barry Douglas with a cross. 32' Corner, (WW) Conceded by William Buckley. 30' Attempt missed. Mark Beevers (BW) header from very close range is close, but misses the top right corner. Assisted by Filipe Morais with a cross following a set piece situation. 29' Foul by Matt Doherty (WW). 29' William Buckley (BW) wins a free kick on the left wing. 27' Attempt saved. Adam Le Fondre (BW) left footed shot from the centre of the box is saved in the centre of the goal. Assisted by Antonee Robinson with a cross. 25' Willy Boly (WW) wins a free kick in the defensive half. 25' Foul by Adam Le Fondre (BW). 23' Attempt saved. Filipe Morais (BW) header from the left side of the box is saved in the top centre of the goal. Assisted by William Buckley. 23' Foul by Matt Doherty (WW). 23' William Buckley (BW) wins a free kick on the left wing. 21' Romain Saiss (WW) wins a free kick in the defensive half. 21' Foul by Karl Henry (BW). 20' Foul by Barry Douglas (WW). 20' Darren Pratley (BW) wins a free kick in the defensive half. 18' Foul by Danny Batth (WW). 18' Sammy Ameobi (BW) wins a free kick in the attacking half. Goal! Bolton Wanderers 0, Wolverhampton Wanderers 1. Barry Douglas (WW) left footed shot from the left side of the box to the bottom left corner. Bolton have an unchanged squad to choose from as they bid to move clear of the Championship relegation zone when they face already-promoted Wolves. The hosts will start two points above third-from-bottom Barnsley. 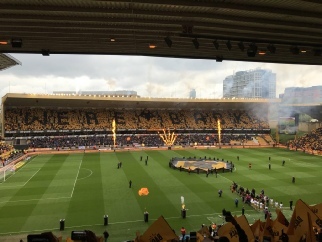 Wolves were promoted on 14 April and require one point from their final three games to be crowned champions. Benik Afobe and Leo Bonatini are on standby to start in place of Ivan Cavaleiro, who injured his hamstring against Birmingham City on Sunday. Bolton are unbeaten in their last 10 home matches against Wolves in all competitions since a 2-1 defeat in the FA Cup in January 1999 (W6 D4). Wolves are looking to complete an English Football League double over the Trotters for the first time since the 1993-94 season. Zach Clough scored three goals in two Championship appearances against Wolves for Bolton, with all three goals coming at the Macron Stadium. Wolves need just five points from their last three games to become the seventh second-tier side to win 100+ points in a single season (adjusting 3 points/win). In only one previous season have the Black Country side won 100+ points in a single season (103 in 2013-14 in the third tier). Phil Parkinson has lost his last four league matches against Wolves, last beating them in his first meeting against them in November 2006 as Hull manager. Two of the five Championship players to provide 10+ assists this season play for Wolves (Barry Douglas 14, Ivan Cavaleiro 12). 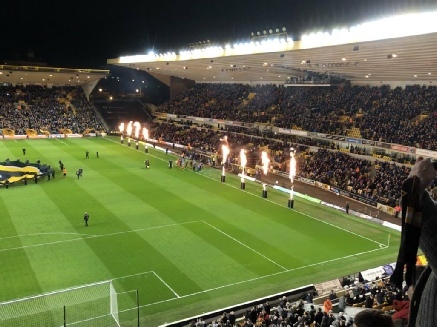 Promoted Wolves edged to within a point of the Championship title as a goal in each half beat 10-man Birmingham City in a typically competitive Midlands derby at Molineux. Matt Doherty's low right wing cross set up Diogo Jota's close-range opener. Substitute Benik Afobe's neat chip settled the outcome late on. But it was a miserable day for Blues captain Harlee Dean, who was sent off against Wolves for the second time this season after slicing down Helder Costa. Wolves were promoted to the Premier League for the first time since relegation in 2012 on Saturday, after Fulham could only draw with Brentford. They will be champions if they avoid defeat at lowly Bolton on Saturday. Garry Monk's Birmingham remain in relegation danger, two points clear of 22nd placed Barnsley, who have a game in hand, with three matches left. It might have been a different story for Blues but for John Ruddy's superb early double save when Lukas Jutkiewicz fed in free-running Maxime Colin, who just escaped the linesman's attention on the edge of the box. Ruddy's first acrobatic block was followed by an even better stop when he quickly readjusted to turn away Colin's second effort. Instead, it was Wolves who went in front when Romain Saiss sent Doherty clear down the right and his hard, low cross curled wickedly out of keeper David Stockdale's reach, allowing Jota to steer in from three yards. Atletico Madrid loanee Jota was then denied by Stockdale at the near post early in the second half before the contest swung even further in Wolves' way when Dean was red carded for bringing down Costa when he was clean through on goal. Jutkiewicz went close to an equaliser when he had a left foot shot tipped over, before substitutes Leo Bonatini and Afobe were denied at the other end. But Afobe brought the show down when he was fed into the box by Alfred N'Diaye and dinked the ball over the advancing Stockdale. As well as captain Dean's red card early in the second half, Blues also had Jonathan Grounds and Michael Morrison booked for heavy challenges on Jota. And Wolves old boy David Davis was probably lucky to escape getting a yellow card as well, for his early challenge on Saiss - although he did not escape vitriolic jeers from the home fans. Former Brentford defender Dean's season could now be over with his second dismissal of the campaign likely to result in a four-match ban - although Blues are set to appeal the decision. It means Birmingham have had a man sent off in four successive derbies against Wolves following red cards for Jack Storer and Paul Robinson last season. Birmingham City manager Garry Monk told BBC WM: "We came to try and make it more difficult for them and, had we taken our chances, we might have got something. The sending off didn't help. You need things to go for you when you're playing a quality side like Wolves. Harlee made an attempt to play the ball and just mistimed his challenge. The ruling is that should have been a yellow card, not red, so we'll be looking for that to be rescinded. We now have three massive games to come. But you can see the players are fighting and are committed.". Match ends, Wolverhampton Wanderers 2, Birmingham City 0. Full Time 90'+3' Second Half ends, Wolverhampton Wanderers 2, Birmingham City 0. 88' Foul by Benik Afobe (WW). 88' Jacques Maghoma , (BC)wins a free kick on the left wing. Goal! 87' Goal! Wolverhampton Wanderers 2, Birmingham City 0. Benik Afobe (WW) right footed shot from the centre of the box to the top right corner. Assisted by Alfred N'Diaye with a through ball. 86' Attempt saved. Lukas Jutkiewicz , (BC)left footed shot from a difficult angle on the right is saved in the bottom left corner. 86' Foul by Léo Bonatini (WW). 86' Craig Gardner , (BC)wins a free kick in the attacking half. 84' Attempt missed. Benik Afobe (WW) left footed shot from the centre of the box is too high. Assisted by Barry Douglas. 82' Benik Afobe (WW) wins a free kick in the defensive half. 82' Foul by Maxime Colin (Birmingham City). 81' Attempt missed. Léo Bonatini (WW) right footed shot from the right side of the box is too high. Assisted by Benik Afobe. 79' Attempt missed. David Davis , (BC)left footed shot from outside the box misses to the left following a corner. 79' Corner, (BC) Conceded by Willy Boly. 78' Sub, (BC) Craig Gardner replaces Cheikh Ndoye. 75' Attempt missed. Jacques Maghoma , (BC)right footed shot from outside the box is too high from a direct free kick. 75' Foul by Alfred N'Diaye (WW). 75' Jacques Maghoma , (BC)wins a free kick in the attacking half. 74' Sub, (WW) Benik Afobe replaces Diogo Jota. 73' Offside, (WW) Romain Saiss tries a through ball, but Matt Doherty is caught offside. 73' Attempt saved. Romain Saiss (WW) right footed shot from the centre of the box is saved in the bottom left corner. Assisted by Léo Bonatini with a through ball. 70' Sub, (WW) Alfred N'Diaye replaces Rúben Neves. 66' Corner, Wolverhampton Wanderers. Conceded by Wes Harding. 65' Attempt missed. Barry Douglas (WW) left footed shot from outside the box is too high. Assisted by Hélder Costa. 64' Attempt blocked. Jacques Maghoma , (BC)right footed shot from outside the box is blocked. 64' Corner, (BC) Conceded by Romain Saiss. 63' Foul by Matt Doherty (WW). 63' Jacques Maghoma , (BC)wins a free kick on the left wing. 62' Sub, (BC) Jacques Maghoma replaces Jonathan Grounds. 59' Corner, (BC) Conceded by Willy Boly. 59' Attempt blocked. Lukas Jutkiewicz , (BC)left footed shot from the left side of the box is blocked. Assisted by Cheikh Ndoye. 58' Foul by Hélder Costa (WW). 58' Maxime Colin , (BC)wins a free kick on the right wing. 58' Corner, (BC) Conceded by John Ruddy. 57' Attempt saved. Lukas Jutkiewicz , (BC)left footed shot from the left side of the box is saved in the top centre of the goal. Assisted by Jonathan Grounds. 56' Foul by Willy Boly (WW). 56' Cheikh Ndoye , (BC)wins a free kick in the defensive half. 55' Ryan Bennett (WW) wins a free kick in the defensive half. 55' Foul by Lukas Jutkiewicz (Birmingham City). 54' Attempt missed. Rúben Neves (WW) right footed shot from outside the box is close, but misses to the right from a direct free kick. 54' Sub, (BC) Marc Roberts replaces Maikel Kieftenbeld. Second Half begins Wolverhampton Wanderers 1, Birmingham City 0. Half Time 45'+4' First Half ends, Wolverhampton Wanderers 1, Birmingham City 0. 45'+3' Attempt blocked. Matt Doherty (WW) right footed shot from the right side of the box is blocked. Assisted by Hélder Costa. 45'+2' Attempt missed. Matt Doherty (WW) right footed shot from outside the box misses to the left following a corner. 45'+2' Corner, (WW) Conceded by Jota. 45' Attempt missed. Lukas Jutkiewicz , (BC)header from the centre of the box misses to the right. Assisted by Wes Harding with a cross. Booking 43' Michael Morrison , (BC)is shown the yellow card for a bad foul. 42' Diogo Jota (WW) wins a free kick in the attacking half. 42' Foul by Michael Morrison (Birmingham City). 39' Foul by Willy Boly (WW). 39' Lukas Jutkiewicz , (BC)wins a free kick in the defensive half. 37' Foul by Ryan Bennett (WW). 37' Michael Morrison , (BC)wins a free kick in the defensive half. 37' Corner, (WW) Conceded by Wes Harding. 35' Offside, (BC) David Stockdale tries a through ball, but Lukas Jutkiewicz is caught offside. 35' Attempt saved. Léo Bonatini (WW) right footed shot from the centre of the box is saved in the bottom right corner. Assisted by Hélder Costa. Booking 33' Jonathan Grounds , (BC)is shown the yellow card for a bad foul. 32' Diogo Jota (WW) wins a free kick on the right wing. 32' Foul by Jonathan Grounds (Birmingham City). 28' Offside, (WW) Conor Coady tries a through ball, but Matt Doherty is caught offside. 26' Romain Saiss (WW) wins a free kick in the defensive half. 26' Foul by David Davis (Birmingham City). 25' Delay over. They are ready to continue. 24' Delay in match Rúben Neves (WW) because of an injury. Goal! 21' Goal! Wolverhampton Wanderers 1, Birmingham City 0. Diogo Jota (WW) left footed shot from very close range to the bottom left corner. Assisted by Matt Doherty. 19' Barry Douglas (WW) wins a free kick in the defensive half. 19' Foul by Maikel Kieftenbeld (Birmingham City). 18' Foul by Léo Bonatini (WW). 18' Harlee Dean , (BC)wins a free kick in the defensive half. 17' Attempt saved. Rúben Neves (WW) right footed shot from outside the box is saved in the bottom right corner. Assisted by Diogo Jota. 16' Sub, (WW) Léo Bonatini replaces Ivan Cavaleiro because of an injury. 15' Attempt saved. Rúben Neves (WW) right footed shot from outside the box is saved in the top centre of the goal. Assisted by Matt Doherty. 11' Attempt saved. Maxime Colin , (BC)left footed shot from the centre of the box is saved in the centre of the goal. Assisted by Lukas Jutkiewicz with a through ball. 8' Foul by Diogo Jota (WW). 8' Cheikh Ndoye , (BC)wins a free kick in the defensive half. 7' Offside, (WW) Hélder Costa tries a through ball, but Matt Doherty is caught offside. 5' Rúben Neves (WW) wins a free kick in the defensive half. 5' Foul by Lukas Jutkiewicz (Birmingham City). 3' Diogo Jota (WW) wins a free kick in the attacking half. 3' Foul by Cheikh Ndoye (Birmingham City). Kick Off. First Half begins. Promoted Wolves will look to add the Championship title as they play host to Midlands rivals Birmingham City. Brentford's late equaliser at second-placed Fulham ensured Wolves' return to the Premier League and they will go up as champions if they win at Molineux. Relegation-threatened Blues hope Sam Gallagher is fit after the calf injury that has kept him out for a month. Without the on-loan Southampton player, boss Garry Monk has just one recognised striker in Lukas Jutkiewicz. Che Adams serves the final game of his ban, which could mean Jeremie Boga starting out of position again up front. Monk's side, who pulled clear of trouble with a timely run of straight wins, have picked up just a point from their last two games. But they are guaranteed to go into Sunday's derby still outside the relegation zone as 21st-placed Bolton and 22nd-placed Barnsley face each other the previous day. Wolves have won only two of their last 10 home matches against Birmingham in all competitions. Last season's 2-1 home defeat, in which ex-Wolves man David Davis got the winner, was one of only two wins for Gianfranco Zola in his 22 games City boss. But Birmingham have only won two of their last 11 league meetings with Wolves, the most recent meeting being a 1-0 home defeat in December, when Leo Bonatini got the most recent of this season's 12 goals. There has been a red card in each of the last three Championship meetings between the clubs - all three for Birmingham (Jack Storer, Paul Robinson and Harlee Dean). Garry Monk is the seventh different boss to manage in this fixture since the start of 2016-17 (Walter Zenga, Gary Rowett, Paul Lambert, Gianfranco Zola, Nuno, Steve Cotterill and Monk being the others). Ruben Neves scored the goal of a lifetime as Wolves comfortably beat Derby County to move within two points of promotion to the Premier League. Fellow Portuguese star Diogo Jota also scored as the Championship leaders damaged Derby's hopes of securing a play-off place. Jota's neat early lob set Wolves on the way to a 15th home win of the season. Neves then hammered a stunning 30-yard volley into the top corner shortly after the break to seal the win. Wolves will now secure a return to the Premier League if they beat local rivals Birmingham City on Sunday. But it could happen even sooner if second-placed Fulham fail to beat Brentford at home on Saturday. Derby remain in fifth place on 68 points, within reach of a clutch of chasing clubs, but still with a game in hand - last month's controversial postponement against Cardiff City. Wolves began the night still needing a further five points to win back the Premier League place they lost in 2012. And, at a near capacity Molineux, there never appeared much doubt that they would claim them. It took just six minutes for them to take the lead when defender Willy Boly's angled 40-yard lofted pass foxed the Rams defence sufficiently to leave Jota unmarked inside the penalty area 12 yards from goal. And, with his back to goal, and only Carson for company, he impudently flicked the ball in the air before gently lifting a right foot lob past the stranded keeper. It could have been more by the break. Instead, it took another six minutes at the start of the second half to truly light up a cold, wet night in the Black Country. Taking delivery from a Derby half clearance 30 yards out, Neves flicked the ball up, took careful aim and drilled his dipping right-foot volley just under Scott Carson's bar. Match ends, Wolverhampton Wanderers 2, Derby County 0. Full Time 90'+5' Second Half ends, Wolverhampton Wanderers 2, Derby County 0. 90'+4' Foul by Tom Lawrence (DC). 86' Delay over. They are ready to continue. 85' Sub, (DC). Jamie Hanson replaces Matej Vydra. 85' Delay in match Rúben Neves (WW) because of an injury. 83' Hélder Costa (WW) wins a free kick in the attacking half. 83' Foul by Curtis Davies (DC). 82' Sub, (DC). Cameron Jerome replaces David Nugent. 82' Sub, (WW) Morgan Gibbs-White replaces Ivan Cavaleiro. 81' Delay over. They are ready to continue. 80' Delay in match Tom Lawrence (DC) because of an injury. 78' Ivan Cavaleiro (WW) wins a free kick on the right wing. 78' Foul by Tom Lawrence (DC). 74' Sub, (WW) Léo Bonatini replaces Diogo Jota. 73' Sub, (DC). Kasey Palmer replaces Joe Ledley. 72' Corner, (WW) Conceded by Joe Ledley. 67' Foul by Ivan Cavaleiro (WW). 67' Joe Ledley (DC) wins a free kick in the attacking half. 66' Sub, (WW) Hélder Costa replaces Benik Afobe. 66' Rúben Neves (WW) wins a free kick in the defensive half. 66' Foul by Tom Lawrence (DC). 64'Corner, (DC). Conceded by Romain Saiss. 63' Attempt blocked. Tom Huddlestone (DC) right footed shot from outside the box is blocked. 63' Foul by Conor Coady (WW). 63' Matej Vydra (DC) wins a free kick in the attacking half. Booking 61' Ryan Bennett (WW) is shown the yellow card. 61' Foul by Ryan Bennett (WW). 61' Matej Vydra (DC) wins a free kick in the attacking half. 60' Attempt saved. Diogo Jota (WW) left footed shot from the left side of the box is saved in the bottom right corner. Assisted by Ivan Cavaleiro. 59' Attempt blocked. Diogo Jota (WW) right footed shot from the left side of the box is blocked. 58' Foul by Barry Douglas (WW). 58' Andreas Weimann (DC) wins a free kick in the defensive half. 56' Foul by Matt Doherty (Wolverhampton Wanderers). 56' Tom Lawrence (DC) wins a free kick on the left wing. 54' Attempt missed. David Nugent (DC) right footed shot from outside the box misses to the right. Assisted by Matej Vydra. 52' Foul by Willy Boly (WW). 52' Matej Vydra (DC) wins a free kick on the right wing. 52' Foul by Willy Boly (WW). 52' Matej Vydra (DC) wins a free kick on the right wing 52' Foul by Willy Boly (Wolverhampton Wanderers). 52' Matej Vydra (Derby County) wins a free kick on the right wing. right footed shot from outside the box to the top left corner following a corner. 50' Corner, (WW) Conceded by Andre Wisdom. Second Half begins Wolverhampton Wanderers 1, Derby County 0. 45'+2' First Half ends, Wolverhampton Wanderers 1, Derby County 0. 45'+1' Attempt missed. Diogo Jota (WW) left footed shot from outside the box is too high. 45' Rúben Neves (WW) wins a free kick in the defensive half. 45' Foul by David Nugent (DC). 41' Attempt blocked. Tom Lawrence (DC) right footed shot from outside the box is blocked. 39' Foul by Diogo Jota (WW). 39' Matej Vydra (DC) wins a free kick in the attacking half. 37' Attempt missed. Benik Afobe (WW) header from the centre of the box misses to the right. Assisted by Barry Douglas with a cross following a set piece situation. 36' Diogo Jota (WW) wins a free kick on the left wing. 36' Foul by Tom Huddlestone (DC). 35' Attempt missed. Ryan Bennett (WW) header from very close range is too high following a corner. 35' Corner, (WW) Conceded by Scott Carson. 34' Attempt saved. Rúben Neves (WW) right footed shot from outside the box is saved in the top centre of the goal. 33' Diogo Jota (WW) wins a free kick in the attacking half. 33' Foul by Andreas Weimann (DC). 32' Foul by Ryan Bennett (WW). 32' Tom Lawrence (DC) wins a free kick on the left wing. 30' Foul by Diogo Jota (WW). 30' Matej Vydra (DC) wins a free kick in the defensive half. 22' Foul by Ivan Cavaleiro (WW). 22' Joe Ledley (DC) wins a free kick in the defensive half. 22' Offside, (DC). Chris Baird tries a through ball, but Alex Pearce is caught offside. 21' Foul by Romain Saiss (WW). 21' Matej Vydra (DC) wins a free kick on the left wing. 20' Ryan Bennett (WW) wins a free kick in the defensive half. 20' Foul by David Nugent (DC). 19' Attempt missed. Benik Afobe (WW) header from the centre of the box is too high. Assisted by Ivan Cavaleiro with a cross. 18' Attempt saved. Tom Huddlestone (DC) right footed shot from outside the box is saved in the top left corner. Assisted by Tom Lawrence. 15' Corner, (WW) Conceded by Joe Ledley. 14' Corner, (WW) Conceded by Curtis Davies. 14' Attempt saved. Rúben Neves (WW) right footed shot from outside the box is saved in the bottom right corner. Assisted by Romain Saiss. 11' Ivan Cavaleiro (WW) wins a free kick on the right wing. 11' Foul by Tom Huddlestone (DC). 6' Goal! Wolverhampton Wanderers 1, Derby County 0. Diogo Jota (WW) left footed shot from the centre of the box to the top left corner. Assisted by Willy Boly with a through ball. 5' Attempt blocked. Rúben Neves (WW) right footed shot from outside the box is blocked. Assisted by Matt Doherty. 5' Corner, (WW) Conceded by Alex Pearce. 4' Ryan Bennett (WW) wins a free kick in the defensive half. 4' Foul by David Nugent (DC). 3' Offside, (DC). Tom Huddlestone tries a through ball, but David Nugent is caught offside. 2' Attempt missed. Andreas Weimann (DC) right footed shot from outside the box is too high. Assisted by Chris Baird following a corner. 1' Corner, (DC). Conceded by Willy Boly. Leaders Wolves will move to within two points of promotion to the Premier League if they beat Derby County. Head coach Nuno Espirito Santo must decide if he recalls Helder Costa and Ivan Cavaleiro, who were both left out for the dramatic win over Cardiff City. Derby County boss Gary Rowett could name an unchanged side for the third game following back-to-back wins. Ikechi Anya (calf), Bradley Johnson and Marcus Olsson are out but Johnson and Olsson are close to returning. Fulham's win over Reading on Tuesday means Wolves still need five points from their remaining five matches to return to the top flight for the first time since 2012. 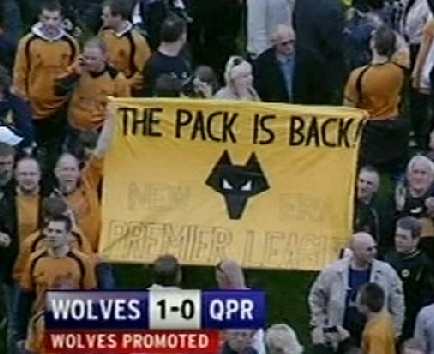 Wolves' last league double over Derby was in the 2008-09 season, when they won promotion to the Premier League. The Rams last won back-to-back away league matches at Molineux in October 1992. If Wolves win, they will have 92 points. Even when converted to three points for a win, in only one Football League campaign have they ever earned more (103 in League One in 2013-14). Indeed, their previous highest in a second tier campaign was the 90 they earned in 2008-09, when they won the division and were promoted to the Premier League. Derby have kept a clean sheet in seven of their last 11 Championship away games. Gary Rowett's two previous Championship visits to Molineux have both ended goalless (in November 2014 and March 2016 as Birmingham manager). Cardiff City missed two stoppage-time penalties a s they lost to Championship leaders Wolves in a dramatic finale. At a packed Cardiff City Stadium, Ruben Neves scored a brilliant second-half free-kick from 25 yards. After being bundled in the box, Cardiff's Gary Madine saw his low penalty saved by John Ruddy. Moments later, Junior Hoilett blasted a second spot-kick against the bar as Wolves extended their lead at the top of the table to nine points. It was a stupefying finish to what had otherwise been something of a slow burner - an absorbing but unspectacular encounter between two very different but well-matched teams. It was also a demoralising end to the game for Cardiff, who were twice given hope of rescuing a point when referee Mike Dean pointed to the spot - only for their missed penalties to consign them to a first defeat in 14 games. Their despair was in startling contrast to the jubilation of their opponents, whose coaches and substitutes rushed on to the pitch at the full-time whistle, while their travelling supporters celebrated with riotous gusto in the stands. Whereas Wolves now require just five points from five games to seal their return to the Premier League, Cardiff remain five points clear of third-placed Fulham in a battle for the second automatic promotion place which promises to go down to the wire. Fulham visit Sheffield Wednesday on Saturday and, with the Londoners on an 18-game unbeaten run, Cardiff will be looking over their shoulders. 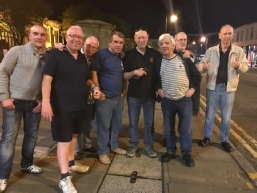 Despite their advantage over the London club, Bluebirds manager Neil Warnock has always insisted the play-offs are their target - though this is more than likely a little mischievous from the wily veteran of seven promotions. Cardiff faced Wolves in the knowledge they only needed a point to be mathematically guaranteed of at least a top-six spot but, like their opponents here, they had their eyes on a bigger and better prize. With a record league crowd of 29,317 gathered under the lights at Cardiff City Stadium, there was a frisson of anticipation for this meeting between the Championship's two leading sides. 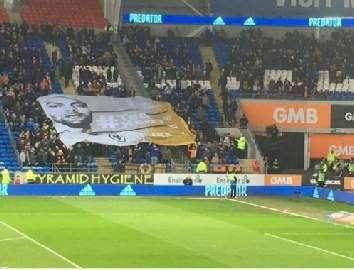 It was an intriguing clash of styles, with the patient, technically accomplished visitors confronted with an abrasive, functional Cardiff side, built very much in the image of their manager. The hosts looked to fuel the fervent atmosphere with their direct approach, Sol Bamba heading one of their many dangerous set-pieces wide. Wolves, by contrast, sought a more measured approach, dominating possession and slowing the tempo as they built their attacks gradually, with Neves and Diogo Jota both testing home goalkeeper Neil Etheridge with powerful efforts. This was the style which had kept Nuno Espirito Santo's men at the top of the Championship since October, and it eventually paid dividends once again against their closest rivals for the title. After Leo Bonatini rounded Etheridge and struck the post, Neves sent the travelling fans wild with a brilliant curling free-kick from 25 yards. The real drama, however, came in added time. Wolves captain Conor Coady had his head in his hands when Dean adjudged him to have fouled Madine in the area, though he was given an almighty reprieve when Ruddy saved the Cardiff striker's poorly struck spot-kick. Astonishingly, another penalty followed moments later after Aron Gunnarsson was fouled in the box. But just as Wolves thought victory had been snatched away from them, Hoilett smashed his effort against the bar to spark scenes of unadulterated jubilation from the visitors who are now within touching distance of promotion. 90'+6' Second Half ends, Cardiff City 0, Wolverhampton Wanderers 1. 90'+5' Penalty conceded by Ivan Cavaleiro (WW) after a foul in the penalty area. 90'+5' Penalty Cardiff City. Aron Gunnarsson draws a foul in the penalty area. 90'+5' Attempt blocked. Anthony Pilkington (CC) left footed shot from very close range is blocked. Assisted by David Junior Hoilett with a headed pass. 90'+4' Corner, (CC) Conceded by John Ruddy. 90'+4' Penalty saved! Gary Madine (CC) fails to capitalise on this great opportunity, right footed shot saved in the bottom right corner. 90'+3' Penalty conceded by Conor Coady (WW) after a foul in the penalty area. 90'+3' Penalty Cardiff City. Anthony Pilkington draws a foul in the penalty area.Booking 89' Hélder Costa (WW) is shown the yellow card for dangerous play. 89' Dangerous play by Hélder Costa (WW). 89' Neil Etheridge (CC) wins a free kick in the defensive half. 86' Attempt missed. Hélder Costa (WW) right footed shot from the centre of the box is close, but misses to the left. Assisted by Rúben Neves. 85' Hélder Costa (WW) wins a free kick in the defensive half. 85' Foul by Sol Bamba (CC). 85' Attempt missed. Aron Gunnarsson (CC) right footed shot from outside the box is close, but misses the top left corner following a set piece situation. 85' Attempt missed. Craig Bryson (CC) left footed shot from outside the box misses to the right. Assisted by Sean Morrison with a headed pass following a set piece situation84' Sub, (CC) Anthony Pilkington replaces Kenneth Zohore. 84' Foul by Ivan Cavaleiro (WW). 84' David Junior Hoilett (CC) wins a free kick in the attacking half. 78' Sub, (WW) Alfred N'Diaye replaces Benik Afobe. 76' Corner, (CC) Conceded by Barry Douglas. Booking 75' Romain Saiss (WW) is shown the yellow card for a bad foul. 75' Foul by Romain Saiss (WW). 75' Nathaniel Mendez-Laing (CC) wins a free kick on the left wing. 75' Attempt missed. Kenneth Zohore (CC) left footed shot from the left side of the box is high and wide to the left. 73' Romain Saiss (WW) wins a free kick in the defensive half. 73' Foul by Gary Madine (CC). 71' Sub, (CC) Gary Madine replaces Yanic Wildschut. 71' Attempt missed. Rúben Neves (WW) right footed shot from outside the box is close, but misses to the right. 70' Delay over. They are ready to continue. 69' Delay in match (WW). 69' Foul by Barry Douglas (WW). 69' David Junior Hoilett (CC) wins a free kick on the right wing. Goal! 67' Goal! Cardiff City 0, Wolverhampton Wanderers 1. Rúben Neves (WW) from a free kick with a right footed shot to the top left corner. Second Half begins Cardiff City 0, Wolverhampton Wanderers 0. 45'+1' First Half ends, Cardiff City 0, Wolverhampton Wanderers 0. 45' Matt Doherty (WW) wins a free kick on the right wing. 45' Foul by Aron Gunnarsson (CC). 41' Attempt missed. Aron Gunnarsson (CC) right footed shot from the right side of the box misses to the left. Assisted by Craig Bryson following a corner. 40' Corner, (CC) Conceded by Rúben Neves. 38' Attempt missed. Romain Saiss (WW) right footed shot from outside the box is high and wide to the left. 37' Corner, (CC) Conceded by John Ruddy. 37' Attempt saved. Yanic Wildschut (CC) right footed shot from outside the box is saved in the top right corner. 36' Foul by Romain Saiss (WW). 36' Kenneth Zohore (CC) wins a free kick in the attacking half. 35' Attempt missed. Joe Bennett (CC) left footed shot from the left side of the box is close, but misses to the right. Assisted by David Junior Hoilett. 32' Foul by Willy Boly (WW). 32' Kenneth Zohore (CC) wins a free kick in the attacking half. 31' Attempt blocked. Craig Bryson (CC) left footed shot from outside the box is blocked. Assisted by Aron Gunnarsson. 23' Attempt blocked. Léo Bonatini (WW) right footed shot from outside the box is blocked. Assisted by Willy Boly. 20' Diogo Jota (WW) wins a free kick in the defensive half. 19' Foul by Lee Peltier (CC). 16' Attempt missed. Kenneth Zohore (CC) right footed shot from outside the box is high and wide to the right. 15' Corner, (CC) Conceded by Ryan Bennett. 15' Attempt blocked. Kenneth Zohore (CC) left footed shot from outside the box is blocked. Assisted by Craig Bryson. 13' Offside, (CC) Sean Morrison tries a through ball, but David Junior Hoilett is caught offside. 11' Foul by Willy Boly (WW). 11' Kenneth Zohore (CC) wins a free kick on the right wing. 8' Corner, (WW) Conceded by Neil Etheridge. 8' Attempt saved. Diogo Jota (WW) right footed shot from outside the box is saved in the top centre of the goal. 7' Corner, (WW) Conceded by Neil Etheridge. 7' Attempt saved. Rúben Neves (WW) right footed shot from outside the box is saved in the top left corner. Assisted by Romain Saiss. 4' Attempt missed. Sol Bamba (CC) header from very close range misses to the right. Assisted by David Junior Hoilett with a cross following a corner. 3' Corner, (CC) Conceded by Romain Saiss. 3' Attempt blocked. Sol Bamba (CC) right footed shot from the centre of the box is blocked. 3' Corner, (CC) Conceded by Willy Boly. 1' Corner, (WW) Conceded by Sean Morrison. Cardiff City can reduce the gap between them and leaders Wolves to just three points with victory in Friday's meeting of the Championship's top two. The Bluebirds, who also have a game in hand, are the form team in the division with nine wins in 11 unbeaten games. Wolves boss Nuno Espirito Santo will have Championship player of the season nominee Ruben Neves and defender Matt Doherty back after suspension. August's corresponding game at Molineux finished in a 2-1 win for Cardiff. Wolves have stabilised after defeats by Fulham and Aston Villa, having now gone four games without defeat following the home midweek draw with Hull City. Nuno's opposite number Neil Warnock, who is bidding for a record eighth promotion of his managerial career, could bring Joe Ralls back into the Cardiff squad, with Marko Grujic dropping to the bench. Warnock is the Championship manager of the year, voted for by his fellow Championship managers. But second-placed Cardiff surprisingly had no players named in the team of the season, which featured three Wolves players, Neves, keeper John Ruddy and captain Conor Coady. Cardiff City manager Neil Warnock: "There's one or two who are the best in the league but not had particularly good seasons. I wouldn't swap many in my side. You don't realise how good some of our players are until you're coaching them. Our main asset is our togetherness. They don't need (any extra motivation). For me they're all player of the seasons." Wolves head coach Nuno Espirito Santo: "Cardiff are a tough team. They have proved themselves throughout the competition. They are a hard team to play against. But we know what we are going to face and we are ready." SAM's prediction Home win 35% Draw 28% Away win 37% SAM, the Sports Analytics Machine, is a super-computer built by @ProfIanMcHale of the University of Liverpool. Match facts Cardiff have won four of their last five Championship meetings with Wolves (L1), including the last two at the Cardiff City Stadium. Wolves have kept one clean sheet in their last 12 away matches at Cardiff in all competitions (W3 D3 L6), a 1-0 win in February 2015. Wolves have scored the first goal in 28 league games this season, winning 25 of those games (D3) - both league-highs. Cardiff have won 10 and lost none of their last 13 league games. They have also won each of their last seven home league games - they last won eight in a row back in December 2012 (10), a season in which they won the Championship. Kenneth Zohore has had a hand in six goals in his last seven league games (four goals, two assists), after assisting just one goal and scoring none in his previous eight. No Championship player has provided more assists this season than Wolves' defender Barry Douglas (14). It is the most assists by a Wolves player in a Championship campaign since Michael Kightly delivered 18 in 2008-09. Championship leaders Wolves were denied the chance to move eight points clear at the top as Hull boosted their survival hopes with a draw at Molineux. Diogo Jota netted from the spot after being fouled by Michael Hector, before Roderick Miranda pulled down Hull's David Meyler, who stepped up to level. The visitors took a shock lead through Ryan Bennett's own goal, but debutant Oskar Buur headed Wolves back on terms. The draw increased the hosts' advantage over Cardiff, in second, to six points. 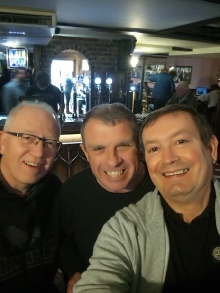 Wolves, who will travel to Cardiff on Friday, saw their advantage over third-placed Fulham reduced to 11 points with six games remaining, as the Cottagers beat Leeds. With the Bluebirds having drawn on Monday, the leaders started brightly against Hull, with Romain Saiss' header from Barry Douglas' early cross well saved by Allan McGregor, before Jota's opener. Hull's equaliser came in frustrating fashion for the hosts, after Helder Costa sloppily conceded possession and Miranda hauled down Meyler, who calmly converted the resultant penalty to net his first goal since September. Despite starting the night just six points above the relegation zone, the Tigers were arguably the better side after half-time and deserved their lead when Bennett slid in to his own net, under pressure from Fraizer Campbell at the far post. However, 20-year-old substitute Buur's header ensured Wolves avoided what would have been only their seventh league loss of the season, with the result appearing to merely delay their seemingly-inevitable return to the Premier League. Match ends, Wolverhampton Wanderers 2, Hull City 2. Full Time 90'+5' Second Half ends, Wolverhampton Wanderers 2, Hull City 2. 90'+3' Benik Afobe (WW) wins a free kick in the defensive half. 90'+3' Foul by Max Clark (HC). 90'+1' Corner, (WW) Conceded by Allan McGregor. 90' Attempt saved. Willy Boly (WW) right footed shot from outside the box is saved in the bottom left corner. Assisted by Ryan Bennett. 88' Corner, (WW) Conceded by Fraizer Campbell. Booking 87' Fikayo Tomori (HC) is shown the yellow card for a bad foul. 87' Hélder Costa (WW) wins a free kick on the left wing. 87' Foul by Fikayo Tomori (HC). 86' Morgan Gibbs-White (WW) wins a free kick on the left wing. 86' Foul by Markus Henriksen (HC). 84' Foul by Morgan Gibbs-White (WW). 84' Fraizer Campbell (HC) wins a free kick in the defensive half. Goal! Second Half begins Wolverhampton Wanderers 1, Hull City 1. 45'+3' First Half ends, Wolverhampton Wanderers 1, Hull City 1. 45' Foul by Markus Henriksen (HC). 45' Alfred N'Diaye (WW) wins a free kick on the left wing. 42' Foul by Diogo Jota (WW). 42' Markus Henriksen (HC) wins a free kick in the defensive half. 40' Dangerous play by Hélder Costa (WW). 40' Max Clark (HC) wins a free kick in the attacking half. 40' Foul by Barry Douglas (WW). 40' Markus Henriksen (HC) wins a free kick in the defensive half. 39' Hélder Costa (WW) wins a free kick in the defensive half. 39' Foul by Max Clark (HC). Goal! 37' Goal! Wolverhampton Wanderers 1, Hull City 1. David Meyler (HC) converts the penalty with a right footed shot to the centre of the goal. 37' Penalty conceded by Roderick Miranda (WW) after a foul in the penalty area. 37' Penalty Hull City. David Meyler draws a foul in the penalty area. 37' Attempt blocked. Jon Toral (HC) left footed shot from outside the box is blocked. Assisted by Ola Aina. 35' Stephen Kingsley (HC) wins a free kick in the attacking half. 35' Foul by Roderick Miranda (WW). 33' Foul by Barry Douglas (WW). 33' Ola Aina (HC) wins a free kick in the defensive half. 26' Delay over. They are ready to continue. 25' Delay in match Romain Saiss (WW) because of an injury. 24' Attempt missed. Hélder Costa (WW) left footed shot from outside the box misses to the left. Assisted by Ivan Cavaleiro. 23' Foul by Ola Aina (HC). 23' Barry Douglas (WW) wins a free kick on the left wing. 22' Foul by Diogo Jota (WW). 22' Max Clark (HC) wins a free kick in the defensive half. 21' Corner, (WW) Conceded by Max Clark. Goal! 18' Goal! Wolverhampton Wanderers 1, Hull City 0. Diogo Jota (WW) converts the penalty with a right footed shot to the bottom left corner. 17' Penalty conceded by Michael Hector (HC) after a foul in the penalty area. 17' Penalty Wolverhampton Wanderers. Diogo Jota draws a foul in the penalty area. 15' Attempt missed. David Meyler (HC) left footed shot from the centre of the box is high and wide to the left. Assisted by Ola Aina with a headed pass following a set piece situation. 14' Jon Toral (HC) wins a free kick in the attacking half. 14' Foul by Alfred N'Diaye (WW). Booking 9' Jon Toral (HC) is shown the yellow card for a bad foul. 9' Alfred N'Diaye (WW) wins a free kick on the left wing. 9' Foul by Jon Toral (HC). 4' Attempt saved. Jon Toral (HC) left footed shot from outside the box is saved in the centre of the goal. Assisted by Ola Aina. 4' Corner, (HC) Conceded by Barry Douglas. 3' Foul by Diogo Jota (WW). 3' Markus Henriksen (HC) wins a free kick in the defensive half. 2' Corner, (WW) Conceded by Allan McGregor. 2' Attempt saved. Romain Saiss (WW) header from the centre of the box is saved in the top centre of the goal. Assisted by Barry Douglas with a cross. 1' Hélder Costa (WW) wins a free kick in the attacking half. 1' Foul by Michael Hector (HC). Championship leaders Wolves are without full-back Ruben Neves and full-back Matt Doherty, who are both suspended for the visit of Hull. Both were sent off in Friday's game at Middlesbrough, which Wolves won 2-1 despite playing the final 20 with nine men. Hull defender Angus MacDonald is a doubt for the trip to Molineux. The former Barnsley centre-back limped off during the second half of Saturday's 0-0 draw with Aston Villa. Wolves haven't completed a league double over the Tigers since the 2005/06 season. Hull have won just one of their last seven league trips to Molineux (D3 L3), a 1-0 victory in September 2007 courtesy of a Dean Windass penalty. Wolves have lost none of their nine matches this season played on Tuesday (W6 D3) in all competitions. Nigel Adkins has taken charge of eight Championship matches against sides starting the day top and is yet to win any of them (D3 L5). Fraizer Campbell has had a hand in five goals in four league starts against Wolves (three goals, two assists). Benik Afobe has scored three goals in his last two home league games for Wolves - he's never scored in three in a row for them at Molineux. 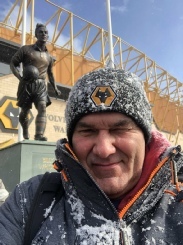 Wolves had been shown only two red cards this season before Ruben Neves and Matt Doherty's dismissals - both on Friend who should not have been on the pitch. Wolves held on to beat Middlesbrough and extend their lead at the top of the Championship to six points despite two second-half red cards. Helder Costa's sweetly hit volley and Ivan Cavaleiro's close-range header gave Wolves a two-goal lead. But Boro dominated after Ruben Neves and Matt Doherty were shown second yellow cards for rash challenges. Patrick Bamford rifled in to give his side hope, and Stewart Downing fired agonisingly wide in added time. Second Half begins Middlesbrough 0, Wolverhampton Wanderers 2. 45'+3' First Half ends, (Boro) 0, Wolverhampton Wanderers 2. 44' Hélder Costa(WW) wins a free kick on the right wing. 44' Foul by Stewart Downing (Boro). 42' Foul by Hélder Costa(WW). 42' George Friend (Boro) wins a free kick on the left wing. 41' Foul by Matt Doherty(WW). 41' George Friend (Boro) wins a free kick in the defensive half. Booking 40' John Ruddy (WW) is shown the yellow card. Goal! 37' Goal! Middlesbrough 0, Wolverhampton Wanderers 2. Ivan Cavaleiro(WW) header from very close range to the bottom left corner following a corner. 37' Attempt saved. Willy Boly(WW) header from the right side of the six yard box is saved in the centre of the goal. Assisted by Barry Douglas with a cross. 36' Corner, (WW) Conceded by Darren Randolph. 36' Attempt saved. Rúben Neves(WW) right footed shot from outside the box is saved in the top right corner. Assisted by Romain Saiss. 34' Ivan Cavaleiro(WW) wins a free kick in the defensive half. 34' Foul by Ryan Shotton (Boro). Goal! 32' Goal! Middlesbrough 0, Wolverhampton Wanderers 1. Hélder Costa(WW) left footed shot from the right side of the six yard box to the high centre of the goal. Assisted by Barry Douglas. 32' Attempt saved. Hélder Costa(WW) left footed shot from the right side of the box is saved in the centre of the goal. Assisted by Matt Doherty. 30' Foul by Benik Afobe(WW). 30' Adam Clayton (Boro) wins a free kick on the right wing. 28' Foul by Matt Doherty(WW). 28' George Friend (Boro) wins a free kick in the defensive half. 26' Foul by Hélder Costa(WW). 26' Ben Gibson (Boro) wins a free kick in the defensive half. 25' Attempt missed. George Friend (Boro) left footed shot from outside the box is high and wide to the left. Assisted by Muhamed Besic with a headed pass. 22' Attempt blocked. Muhamed Besic (Boro) right footed shot from outside the box is blocked. 20' Attempt saved. Patrick Bamford (Boro) header from the right side of the six yard box is saved in the top right corner. Assisted by Daniel Ayala with a headed pass. 19' Corner, (Boro). Conceded by Barry Douglas. 16' Corner, (WW) Conceded by Darren Randolph. 16' Attempt saved. Rúben Neves(WW) right footed shot from outside the box is saved in the bottom right corner. Assisted by Ivan Cavaleiro. 15' Barry Douglas(WW) wins a free kick in the defensive half. 15' Foul by Patrick Bamford (Boro). Booking 11' Grant Leadbitter (Boro) is shown the yellow card for a bad foul. 11' Ivan Cavaleiro(WW) wins a free kick on the left wing. 11' Foul by Grant Leadbitter (Boro). 10' Corner, (Boro). Conceded by Conor Coady. 9' Attempt missed. Benik Afobe(WW) header from very close range misses to the right. Assisted by Barry Douglas with a cross following a set piece situation. 8' Barry Douglas(WW) wins a free kick on the left wing. 8' Foul by Adama Traoré (Boro). 3' Delay over. They are ready to continue. 2' Delay in match Patrick Bamford (Boro) because of an injury. Middlesbrough defender Daniel Ayala is expected to be available for the visit of Championship leaders Wolves after recovering from a groin injury. Striker Rudy Gestede (fractured ankle) is absent for the home side. Wolves have reported no injury issues regarding the players who have returned from international duty. Leading scorer Diogo Jota is still out with the ankle injury he sustained in the 3-0 home win over Reading on 13 March. Wolves are six points ahead of second-placed Cardiff, who have a game in hand, and 13 clear of Fulham and Aston Villa in third and fourth respectively. Four wins from their final eight matches will be enough to secure automatic promotion. Boro are sixth, a point ahead of seventh-placed Bristol City. Match facts Stan Cullis was manager the last time Wolves won at Middlesbrough - in April 1951. Boro are unbeaten in Wolves' 25 subsequent visits - and have never lost to Wanderers at the Riverside Stadium. Having won 1-0 at home to Boro on the opening day of the season, Wolves are chasing a first league double over Boro at the 44th attempt. Boro's Adama Traore has been involved in six goals in his last eight Championship matches (four goals, two assists). 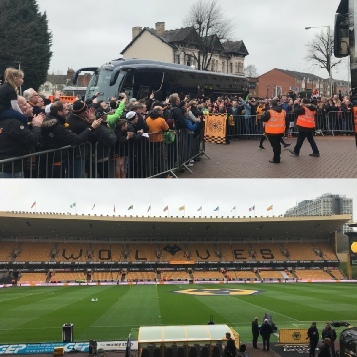 Wolves, who lost 4-1 at Villa in their last away game, have not suffered back-to-back away league defeats in over a year (at Burton and Reading). Boro boss Tony Pulis has ended on the winning side in each of his last four meetings with Wolves, in all competitions. Benik Afobe scored twice as Wolves beat struggling Burton to move six points clear at the top of the Championship. Helder Costa took down Conor Coady's ball and lifted a finish over Stephen Bywater to give Wolves an early lead. Afobe smashed into the top corner from Ruben Neves' through-ball to double their advantage, but Lloyd Dyer's half-volley made it 2-1 before half-time. On-loan Afobe sidefooted in from 10 yards to secure Wolves' win and stretch the lead over second-placed Cardiff. Neil Warnock's Bluebirds can reduce the gap to three points if they record an eighth successive league win when they play Derby County on Sunday. Afobe re-joined Wolves on loan from Bournemouth in January and came close to his first hat-trick since 29 November 2014, in a 6-0 win for MK Dons against Colchester, but Bywater did well to keep the score down as the league leaders finished strongly. Dyer's shot from a half-cleared corner through a crowd of legs saw Burton score with their only shot on target to end a run of four games without a goal. But Wolves simply over-powered the Brewers, who remain three points from safety in 23rd place with one win from their last 12 Championship matches. Full Time 90'+3' Second Half ends, Wolverhampton Wanderers 3, (BA) 1. 90'+2' Corner, (WW) Conceded by Lloyd Dyer. 90'+1' sub, (WW) Alfred N'Diaye replaces Rúben Neves. 90' Léo Bonatini (WW) wins a free kick in the attacking half. 90' Foul by Tomas Egert (BA). 89' Delay over. They are ready to continue. 89' Delay in match Jacob Davenport (BA) because of an injury. 85' Willy Boly (WW) wins a free kick in the defensive half. 85' Foul by Luke Varney (BA). 83' Attempt missed. Morgan Gibbs-White (WW) right footed shot from the centre of the box is high and wide to the right. Assisted by Romain Saiss with a through ball. 82' sub, (BA). Tomas Egert replaces Liam Boyce. 82' sub, (WW) Léo Bonatini replaces Benik Afobe. 77' Morgan Gibbs-White (WW) wins a free kick in the defensive half. 77' Foul by Jacob Davenport (BA). 76' sub, (WW) Morgan Gibbs-White replaces Ivan Cavaleiro. 75' Foul by Romain Saiss (WW). 75' Lloyd Dyer (BA) wins a free kick on the left wing. 74' Romain Saiss (WW) wins a free kick in the defensive half. 74' Foul by Jacob Davenport (BA). 74' Foul by Romain Saiss (WW). 74' Tom Naylor (BA) wins a free kick in the defensive half. 71' Attempt blocked. Matt Doherty (WW) right footed shot from the centre of the box is blocked. 71' Attempt blocked. Matt Doherty (WW) left footed shot from the centre of the box is blocked. Assisted by Ivan Cavaleiro. 70' Matt Doherty (WW) wins a free kick in the attacking half. 70' Foul by Hope Akpan (BA). 70' Attempt blocked. Matt Doherty (WW) left footed shot from outside the box is blocked. 69' Corner, (WW) Conceded by Tom Naylor. 68' Benik Afobe (WW) wins a free kick in the defensive half. 68' Foul by Jake Buxton (BA). 66' Attempt missed. Ivan Cavaleiro (WW) right footed shot from the right side of the box is close, but misses to the right. Assisted by Rúben Neves. 63' Foul by Hélder Costa (WW). 63' Damien McCrory (BA) wins a free kick in the defensive half. 62' Tom Flanagan (BA) wins a free kick in the defensive half. 61' Foul by Barry Douglas (WW). 59' Delay in match Luke Varney (BA) because of an injury. 58' Corner, (BA). Conceded by Conor Coady. Goal! Second Half begins Wolverhampton Wanderers 2, (BA) 1. 45' sub, (BA). Joe Sbarra replaces Marvin Sordell. 45' sub, (BA). Luke Varney replaces Kyle McFadzean. Half Time 45'+3' First Half ends, Wolverhampton Wanderers 2, (BA) 1. 45'+2' Matt Doherty (WW) wins a free kick in the defensive half. 45'+2' Foul by Liam Boyce (BA). 45' Foul by Romain Saiss (WW). 45' Jacob Davenport (BA) wins a free kick in the defensive half. Goal! 44' Goal! Wolverhampton Wanderers 2, (BA) 1. Lloyd Dyer (BA) left footed shot from outside the box to the top left corner following a corner. 43' Corner, (BA). Conceded by Willy Boly. Goal! 41' Goal! Wolverhampton Wanderers 2, (BA) 0. Benik Afobe (WW) right footed shot from the centre of the box to the top left corner. Assisted by Rúben Neves. 39' Attempt missed. Romain Saiss (WW) left footed shot from outside the box misses to the left. 38' Foul by Willy Boly (WW). 38' Marvin Sordell (BA) wins a free kick on the right wing. 37' Attempt saved. Ivan Cavaleiro (WW) left footed shot from outside the box is saved in the bottom left corner. Assisted by Matt Doherty. 35' Barry Douglas (WW) wins a free kick in the defensive half. 35' Foul by Tom Flanagan (BA). 34' Attempt missed. Hélder Costa (WW) left footed shot from outside the box is too high. 33' Rúben Neves (WW) wins a free kick in the defensive half. 33' Foul by Lloyd Dyer (BA). 30' Benik Afobe (WW) wins a free kick in the attacking half. 30' Foul by Jake Buxton (BA). 27' Ivan Cavaleiro (WW) wins a free kick in the attacking half. 27' Foul by Tom Naylor (BA). 25' Delay over. They are ready to continue. 25' Delay in match Marvin Sordell (BA) because of an injury. 24' Foul by Barry Douglas (WW). 24' Marvin Sordell (BA) wins a free kick on the right wing. 23' Attempt blocked. Jacob Davenport (BA) left footed shot from outside the box is blocked. Assisted by Liam Boyce. 23' Attempt blocked. Marvin Sordell (BA) left footed shot from the centre of the box is blocked. Assisted by Damien McCrory with a cross. 22' Foul by Willy Boly (WW). 22' Tom Flanagan (BA) wins a free kick on the right wing. 20' Matt Doherty (WW) wins a free kick on the right wing. 20' Foul by Hope Akpan (BA). 20' Foul by Barry Douglas (WW). 20' Marvin Sordell (BA) wins a free kick in the defensive half. 18' Attempt saved. Rúben Neves (WW) right footed shot from outside the box is saved in the centre of the goal. Assisted by Ivan Cavaleiro. 17' Corner, (BA). Conceded by Willy Boly. Goal! 15' Goal! Wolverhampton Wanderers 1, (BA) 0. Hélder Costa (WW) left footed shot from the centre of the box to the top left corner. Assisted by Conor Coady with a through ball. 13' Offside, (WW) Matt Doherty tries a through ball, but Benik Afobe is caught offside. 9' Corner, (WW) Conceded by Tom Naylor. 7' Offside, (WW) Rúben Neves tries a through ball, but Benik Afobe is caught offside. 6' Offside, (WW) Romain Saiss tries a through ball, but Matt Doherty is caught offside. 2' Corner, (WW) Conceded by Damien McCrory. 1' Attempt missed. Rúben Neves (WW) right footed shot from outside the box is too high. Wolves will be without top scorer Diogo Jota after an ankle injury sustained in the midweek win over Reading. His injury is not as bad as feared, but Ivan Cavaleiro is expected to return in place of the 14-goal forward. Burton Albion could be without several regulars against the leaders, including Jamie Allen who has an ankle injury. Luke Murphy (hamstring) and Martin Samuelsen (illness) are doubts, but new signing Tomas Egert is available after joining for the rest of the season. The Brewers, who are second from bottom in the Championship, have not scored in their previous four matches. Burton Albion manager Nigel Clough told BBC Radio Derby: "We are missing chances all throughout the team. It is not just the strikers. Darren Bent has missed a few and Liam Boyce missed one on Saturday. "But everyone has to take responsibility for scoring goals as you do to stop them as well. "If we were not creating chances that would be more worrying. But we are only three points off safety with nine games left and we are in with a chance." Wolves head coach Nuno told BBC WM: "Diogo Jota is not available for this game. He twist his ankle. He has treatment. We hope it will only be a short time. But we have a squad. We have options. 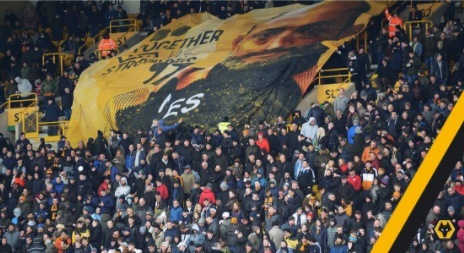 Burton comes to Molineux to fight for something really important for them. It will be a tough match This is one of the toughest competitions in Europe." C hampionship leaders Wolves bounced back from Saturday's heavy defeat at Aston Villa with victory over struggling Reading at Molineux. The hosts were frustrated for much of the first half, until full-back Matt Doherty capitalised on hesitant defending to nod Wolves in front. Cool second-half finishes from Benik Afobe and Doherty sealed three points. The win was soured slightly by Wanderers' top scorer Diogo Jota limping off before the break.But Villa's home defeat by QPR on Tuesday means Wolves now have a 10-point buffer to their third-placed rivals with nine matches remaining. 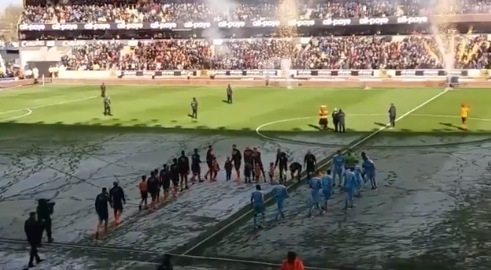 Nuno Espirito Santo's side had won just one of their past five league games heading into the re-arranged fixture against the Royals, postponed because of snow 10 days ago. Wolves' 4-1 loss at Villa Park at the weekend saw the Portuguese make four changes to his side, including a first start for Afobe since returning on loan from Bournemouth in January. And the DR Congo striker rewarded his manager's faith, slotting in Helder Costa's cross, in between Doherty's double. The right-back's two strikes were clinical - the first a powerful header from Barry Douglas' knock back, before stroking the ball in from outside the area. Wolves still have home games to come against four sides in the bottom half - Burton, Hull, Birmingham and Sheffield Wednesday - as they seek a return to the Premier League for the first time since being relegated in 2012. Reading, who failed to register a shot on target, remain in relegation trouble in 19th. Full Time 90'+4' Second Half ends, Wolverhampton Wanderers 3, Reading 0. 90'+3' Attempt missed. Sone Aluko (Reading) right footed shot from outside the box is high and wide to the right. Assisted by Leandro Bacuna. 90'+2' Corner, (WW) Conceded by Anssi Jaakkola. 90'+2' Attempt saved. Hélder Costa (WW) left footed shot from the centre of the box is saved in the centre of the goal. Assisted by Léo Bonatini with a through ball. 87' Alfred N'Diaye (WW) wins a free kick on the right wing. 87' Foul by David Edwards (Reading). 86' Attempt saved. Rúben Neves (WW) right footed shot from outside the box is saved in the centre of the goal. 86' Attempt blocked. Léo Bonatini (WW) right footed shot from outside the box is blocked. Assisted by Barry Douglas with a headed pass. Booking 85' Ryan Bennett (WW) is shown the yellow card for a bad foul. 85' Foul by Ryan Bennett (WW). 85' Modou Barrow (Reading) wins a free kick on the left wing. 83' sub, Reading. Sam Smith replaces Jón Dadi Bödvarsson. 78' sub, (WW) Alfred N'Diaye replaces Romain Saiss. 77' Corner, (WW) Conceded by Liam Moore. 75' Foul by Rúben Neves (WW). 75' Pelle Clement (Reading) wins a free kick in the attacking half. Goal! 73' Goal! Wolverhampton Wanderers 3, Reading 0. Matt Doherty (WW) right footed shot from outside the box to the bottom left corner. Assisted by Ivan Cavaleiro. 72' sub, (WW) Léo Bonatini replaces Benik Afobe. 70' Hélder Costa (WW) wins a free kick in the attacking half. 70' Foul by Tyler Blackett (Reading). 69' Attempt blocked. Ivan Cavaleiro (WW) left footed shot from the centre of the box is blocked. Assisted by Hélder Costa. 68' Ivan Cavaleiro (WW) wins a free kick on the right wing. 68' Foul by Leandro Bacuna (Reading). 67' Benik Afobe (WW) wins a free kick on the right wing. 67' Foul by Modou Barrow (Reading). 66' Foul by Barry Douglas (WW). 66' Sone Aluko (Reading) wins a free kick in the defensive half. 63' sub, Reading. Leandro Bacuna replaces George Evans. 63' Foul by Ivan Cavaleiro (WW). 63' David Edwards (Reading) wins a free kick in the defensive half. 61' Foul by Rúben Neves (WW). 61' Sone Aluko (Reading) wins a free kick in the defensive half. 59' Foul by Romain Saiss (WW). 59' Modou Barrow (Reading) wins a free kick on the left wing. Goal! 58' Goal! Wolverhampton Wanderers 2, Reading 0. Benik Afobe (WW) right footed shot from the centre of the box to the bottom right corner. Assisted by Hélder Costa. 54' Hand ball by Benik Afobe (WW). Booking 54' George Evans (Reading) is shown the yellow card for a bad foul. 53' Hélder Costa (WW) wins a free kick in the attacking half. 53' Foul by George Evans (Reading). 52' Foul by Ryan Bennett (WW). 52' Tiago Ilori (Reading) wins a free kick in the defensive half. 52' Corner, (WW) Conceded by Chris Gunter. 52' Attempt blocked. Barry Douglas (WW) left footed shot from outside the box is blocked. Booking 51' Chris Gunter (Reading) is shown the yellow card for a bad foul. 50' Benik Afobe (WW) wins a free kick in the attacking half. 50' Foul by Chris Gunter (Reading). 49' Rúben Neves (WW) wins a free kick in the attacking half. 49' Foul by George Evans (Reading). 48' Attempt missed. Benik Afobe (WW) right footed shot from the centre of the box misses to the left. Assisted by Matt Doherty with a cross. Second Half begins Wolverhampton Wanderers 1, Reading 0. 45'+6' First Half ends, Wolverhampton Wanderers 1, Reading 0. 45' Corner, Reading. Conceded by Conor Coady. Goal! 40' Goal! Wolverhampton Wanderers 1, Reading 0. Matt Doherty (WW) header from the centre of the box to the bottom left corner. Assisted by Barry Douglas with a headed pass. 38' Attempt missed. Ryan Bennett (WW) right footed shot from outside the box is high and wide to the left. Assisted by Ivan Cavaleiro. 32' Matt Doherty (WW) wins a free kick on the right wing. 32' Foul by Tyler Blackett (Reading). 31' Attempt saved. Benik Afobe (WW) header from the left side of the six yard box is saved in the top left corner. Assisted by Ryan Bennett. 31' Attempt missed. Ryan Bennett (WW) header from the centre of the box misses to the left. Assisted by Ivan Cavaleiro with a cross following a corner. 31' Corner, (WW) Conceded by Tiago Ilori. 30' Corner, (WW) Conceded by Modou Barrow. 27' Offside, (WW) Conor Coady tries a through ball, but Barry Douglas is caught offside. 25' sub, (WW) Ivan Cavaleiro replaces Diogo Jota because of an injury. 25' Delay over. They are ready to continue. 20' Delay in match Diogo Jota (WW) because of an injury. 20' Diogo Jota (WW) wins a free kick in the attacking half. 20' Foul by Pelle Clement (Reading). 17' Attempt saved. Hélder Costa (WW) left footed shot from outside the box is saved in the centre of the goal. Assisted by Rúben Neves. 15' Diogo Jota (WW) wins a free kick on the right wing. 15' Foul by Liam Moore (Reading). 14' Foul by Romain Saiss (WW). 14' Liam Moore (Reading) wins a free kick in the defensive half. 13' Corner, (WW) Conceded by Tyler Blackett. 11' Barry Douglas (WW) wins a free kick in the defensive half. 11' Foul by Sone Aluko (Reading). 11' Foul by Hélder Costa (WW). 11' Sone Aluko (Reading) wins a free kick in the defensive half. 10' Corner, (WW) Conceded by Liam Moore. 8' Offside, (WW) Willy Boly tries a through ball, but Benik Afobe is caught offside. 3' Corner, Reading. Conceded by Romain Saiss. 3' Attempt blocked. Sone Aluko (Reading) left footed shot from outside the box is blocked. Assisted by Pelle Clement. 3' Foul by Willy Boly (WW). 3' Modou Barrow (Reading) wins a free kick in the attacking half. 2' Corner, (WW) Conceded by Chris Gunter. Kick Off First Half begins. Wolves boss Nuno Espirito Santo has the option of making changes following the Championship leaders' heaviest defeat of the season at Aston Villa. Defender Ryan Bennett, striker Benik Afobe and midfielder Romain Saiss are all in contention. Reading striker Yann Kermorgant is back in training and nearing a return following a persistent calf injury. Paul McShane (hamstring) and Joey van den Berg (ankle) are out as Reading look for a first win in eight games. Former Wolves players Jon Dadi Bodvarsson, who scored in Saturday's 2-2 home draw with Leeds United, and Dave Edwards make their first return to Molineux since leaving last summer. The home side are just three points clear of second-placed Cardiff City, who travel to Brentford, while third-placed Aston Villa, seven points off top spot, are at home to QPR. Wolves have picked up just five points out of a possible 15 in a run of just one win in five Championship games. Reading have won just once in 16 Championship matches, against Burton Albion in January - and are winless in seven. Since the two sides shared a 1-1 draw in March 1996, in 10 matches at Molineux, both have won five times. Reading have failed to score in four of their last five league matches against Wolves. Ivan Cavaleiro has had a hand in four of Wolves' last six league goals at Molineux (one goal, three assists). Villa cashed in a bright start when they went ahead from Robert Snodgrass' left-wing corner. Wolves captain Danny Batth sliced his attempted clearance of Mile Jedinak's header and the ball fell for Adomah, who got in ahead of Grabban to slide home his 14th league goal this season from a yard out. If that was decidedly scrappy, so was Wolves' equaliser. After a close escape when home skipper John Terry had to hook away from underneath his own bar, Wolves then attacked down the right through Matt Doherty, who nutmegged Neil Taylor before sending in a wicked low cross. Chester could only got a toe on it to divert it away from goalkeeper Sam Johnstone and the alert Jota bundled his way in ahead of Elmohamady to net his 13th league goal of the season. At half-time the match could have gone either way, but Villa went back in front after 57 minutes with the first of two quick-fire strikes, when Chester got on the end of another Snodgrass left-wing delivery to turn in his second goal in five days. Five minutes later, from Adomah's left-wing cross from the byline, January loan signing Grabban arrived at the near post to get in ahead of Willy Boly and steer in his 16th of the season - and fourth for Villa in successive games. And there was still time for the solo goal of the game when Iceland international Bjarnarson waltzed past three players before toe-poking home from 18 yards. Villa manager Steve Bruce told BBC Sport: "We played very well and we needed to against a decent team. It was a great advert for the Championship. There's 10 games to go and we've given ourselves a chance Wolves have got some very good players. How they got here, that's another question that I don't want to get involved with. But we've got some good players too. We're a threat going forward and they all put a shift in defensively too. The only thing I demand from anyone who plays for me is that you have to put a shift in. I don't mind a mistake. The key for me is to work hard and we worked as a team - but we have to keep doing that." "We made mistakes we should not do and they changed the game. I organise my thoughts and I try to analyse. We try to see what went wrong and get it right for the next game. We need the support of the fans at Molineux on Tuesday night (against Reading). There is pain for everyone right now and we need to bounce back." 90'+2' Attempt blocked. Rúben Neves (WW) right footed shot from outside the box is blocked. Assisted by Léo Bonatini. 90'+1' Attempt saved. Hélder Costa (WW) header from the centre of the box is saved in the centre of the goal. Assisted by Rúben Neves. 88' Matt Doherty (WW) wins a free kick in the defensive half. 88' Foul by Birkir Bjarnason , (AV). 87' Foul by Alfred N'Diaye (WW). 87' Birkir Bjarnason , (AV) wins a free kick in the defensive half. 86' sub, (AV) Scott Hogan replaces Lewis Grabban. Goal! 85' Goal! Aston Villa 4, Wolverhampton Wanderers 1. Birkir Bjarnason , (AV) right footed shot from outside the box to the bottom left corner. Assisted by Henri Lansbury. Booking 83' Jack Grealish , (AV) is shown the yellow card for a bad foul. 83' Rúben Neves (WW) wins a free kick in the defensive half. 83' Foul by Jack Grealish , (AV). 81' sub, (AV) Henri Lansbury replaces Conor Hourihane. Booking 80' Hélder Costa (WW) is shown the yellow card for a bad foul. 80' Foul by Hélder Costa (WW). 80' Jack Grealish , (AV) wins a free kick on the right wing. 80' Attempt blocked. Rúben Neves (WW) right footed shot from a difficult angle and long range on the left is blocked. Booking 79' Conor Hourihane , (AV) is shown the yellow card for a bad foul. 79' Hélder Costa (WW) wins a free kick on the left wing. 79' Foul by Conor Hourihane , (AV). 77' Corner, (WW) Conceded by Ahmed El Mohamady. 76' sub, (WW) Hélder Costa replaces Diogo Jota. 75' sub, (AV) Birkir Bjarnason replaces Albert Adomah. 74' Delay over. They are ready to continue. Booking 73' Conor Coady (WW) is shown the yellow card for a bad foul. 73' Delay in match Robert Snodgrass , (AV) because of an injury. 72' Foul by Conor Coady (WW). 72' Robert Snodgrass , (AV) wins a free kick on the right wing. 71' Corner, (WW) Conceded by James Chester. 71' Attempt blocked. Barry Douglas (WW) left footed shot from outside the box is blocked. 70' Matt Doherty (WW) wins a free kick in the attacking half. 71' Foul by Albert Adomah , (AV). 70' Attempt blocked. Rúben Neves (WW) right footed shot from outside the box is blocked. Assisted by Barry Douglas. 69' Corner, (WW) Conceded by Mile Jedinak. 69' Attempt blocked. Léo Bonatini (WW) left footed shot from the left side of the box is blocked. 68' sub, (WW) Romain Saiss replaces Danny Batth. 67' sub, (WW) Benik Afobe replaces Ivan Cavaleiro. 65' Foul by Ivan Cavaleiro (WW). 65' Jack Grealish , (AV) wins a free kick in the defensive half. 65' Diogo Jota (WW) wins a free kick on the left wing. 65' Foul by Conor Hourihane , (AV). Goal! 62' Goal! Aston Villa 3, Wolverhampton Wanderers 1. Lewis Grabban , (AV) right footed shot from the left side of the six yard box to the centre of the goal. Assisted by Albert Adomah with a cross. 61' Offside, (AV) Mile Jedinak tries a through ball, but Lewis Grabban is caught offside. 60' Offside, (AV) Neil Taylor tries a through ball, but Lewis Grabban is caught offside. Goal! 57' Goal! Aston Villa 2, Wolverhampton Wanderers 1. James Chester , (AV) right footed shot from very close range to the bottom left c orner. Assisted by Robert Snodgrass with a cross following a set piece situation. 57' Foul by Rúben Neves (WW). 57' Robert Snodgrass , (AV) wins a free kick in the attacking half. Booking 55' Alfred N'Diaye (WW) is shown the yellow card for a bad foul. 55' Foul by Alfred N'Diaye (WW). 55' Jack Grealish , (AV) wins a free kick in the attacking half. 54' Foul by Alfred N'Diaye (WW). 54' Robert Snodgrass , (AV) wins a free kick in the defensive half. 53' Conor Coady (WW) wins a free kick in the defensive half. 53' Foul by Lewis Grabban , (AV). 50' Rúben Neves (WW) wins a free kick in the attacking half. 50' Foul by Mile Jedinak , (AV). 49' Foul by Barry Douglas (WW). 49' Robert Snodgrass , (AV) wins a free kick in the defensive half. 48' Corner, (AV) Conceded by Conor Coady. 48' Attempt blocked. Lewis Grabban , (AV) left footed shot from the right side of the box is blocked. Assisted by Robert Snodgrass. 47' Attempt blocked. Albert Adomah , (AV) right footed shot from outside the box is blocked. Assisted by Neil Taylor. Second Half begins Aston Villa 1, Wolverhampton Wanderers 1. Half Time 45'+4' First Half ends, Aston Villa 1, Wolverhampton Wanderers 1. Danny Batth (WW) is shown the yellow card for a bad foul. 37' Foul by Danny Batth (WW). 37' Jack Grealish , (AV) wins a free kick on the left wing. 36' Attempt blocked. Jack Grealish , (AV) right footed shot from outside the box is blocked. Assisted by Conor Hourihane. 30' Barry Douglas (WW) wins a free kick in the defensive half. 30' Foul by Robert Snodgrass , (AV). 28' Foul by Rúben Neves (WW). 28' Jack Grealish , (AV) wins a free kick in the defensive half. 25' Attempt blocked. Conor Hourihane , (AV) left footed shot from outside the box is blocked. 22' Diogo Jota (WW) wins a free kick in the defensive half. 22' Foul by Lewis Grabban , (AV). 21' Attempt missed. Conor Hourihane , (AV) left footed shot from outside the box is high and wide to the left. Assisted by Robert Snodgrass. Goal! 20' Goal! Aston Villa 1, Wolverhampton Wanderers 1. Diogo Jota (WW) right footed shot from very close range to the bottom right corner. 20' Attempt saved. Diogo Jota (WW) left footed shot from very close range is saved in the centre of the goal. 17' Foul by Barry Douglas (WW). 17' Robert Snodgrass , (AV) wins a free kick on the right wing. 14' Foul by Robert Snodgrass , (AV). 14' Barry Douglas (WW) wins a free kick on the left wing. 12' Corner, Wolverhampton Wanderers. Conceded by John Terry. 9' Ahmed El Mohamady , (AV) wins a free kick in the defensive half. 10' Foul by Barry Douglas (WW). Goal! 8' Goal! Aston Villa 1, Wolverhampton Wanderers 0. Albert Adomah , (AV) right footed shot from very close range to the centre of the goal. Assisted by Lewis Grabban following a corner. 7' Corner, (AV) Conceded by Matt Doherty. 3' Hand ball by Robert Snodgrass , (AV). 1' Willy Boly (WW) wins a free kick on the left wing. 1' Foul by Lewis Grabban , (AV). Aston Villa are without experienced midfielder Glenn Whelan for the visit of Championship leaders Wolves. The Republic of Ireland international has been ruled out for several weeks with a calf injury sustained in Tuesday's 3-0 win at Sunderland. Wolves will start the game 10 points clear of Villa, following their own 3-0 midweek win against Leeds United. Championship record signing Ruben Neves is available to return following his two-match suspension for 10 bookings. Wolves midfielder Romain Saiss is one caution away from a two-game ban. Villa striker Jonathan Kodjia is expected to return to training on Monday following the ankle injury he first suffered in April 2017 and which has kept him sidelined since October. Aston Villa manager Steve Bruce told BBC WM: "Wolves are a very, very good side who have been there to be shot at from the start of the season. But the only thing that bothers me is how to beat them. They've bought well and they've got a lot of pace. But, if you get players for £16m or £18m in the Championship, then you should have pace. Whether they're doing anything wrong is for others to address. I've never really got involved in all that. I've got more on my plate trying to pick a team to get a result against them. But we have enough in our locker to give them a good game and I'm quietly confident. It's up to us to upset them. We've lost Glenn Whelan for the foreseeable future, which is a blow as he's one of our most experienced men. He was arguably our best player at Sunderland the other night and would have been really valuable to us." 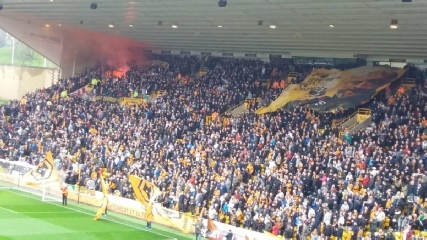 Wolves head coach Nuno told BBC WM: "We know what this game means to our fans. It means a lot. We must control our emotions, but we know what it means to win. You have to celebrate when you do. Everybody should celebrate goals. When you score, it is the moment of greatest joy in football. Villa is a tough game. They are a good team, they have a good manager and are a big club. They have good momentum, but we only focus on what we do on the pitch, how we prepare ourselves and what we want to achieve. "Every game is important, it has been since the beginning and will be to the end. This is one of the toughest competitions in the world, with a lot of tough teams." SAM's prediction Home win 36% Draw 28% Away win 36% SAM, the Sports Analytics Machine, is a super-computer built by @ProfIanMcHale of the University of Liverpool. Villa pair Lewis Grabban (15 - 12 of them for Sunderland) and Albert Adomah (13) have both scored more Championship goals this season than Wolves' two 12-goal top league marksmen Diogo Jota and Leo Bonatini. But Jota and Bonatini got the goals when Wolves beat Villa 2-0 at Molineux in October. 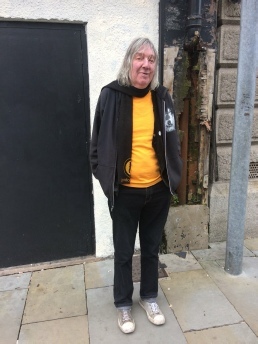 Wolves have not enjoyed a league double over their fellow former Football League founder members since the 1962-63 campaign, when both teams were in the top flight. Villa's 1-0 Premier League defeat by Wolves in March 2011 is their only loss in their last 12 home derbies against the men in gold and black. Wolves have won three of their last six meetings with Villa - as many as in their previous 32 games combined in all competitions. In seven previous meetings with Wolves in the second tier, Steve Bruce has never lost a home league match. By kick-off time on Saturday, Wolves will have been top of the Championship for 113 consecutive days - the longest run since Leicester City's 129 days in a row between December 2013 and May 2014. Wolves restored their six-point lead at the top of the Championship with a dominant win over Leeds at Elland Road. Wanderers had previously gone three league games without a victory, their longest winless run of the season. Two first-half goals came from Barry Douglas corners, with Romain Saiss and Willy Boly heading in from close range. 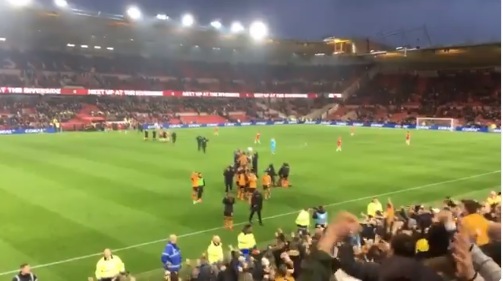 Diogo Jota struck the crossbar with a thunderous shot before Benik Afobe lobbed onrushing goalkeeper Bailey Peacock-Farrell to finish the game. Substitute Afobe's goal was his first since returning to Wolves on loan from Bournemouth in January. With 11 matches left to play, there is a 10-point gap between Wolves and third-placed Aston Villa - their opponents at Villa Park on Saturday. Their margin of victory would have been much wider but for some good first-half saves from Peacock-Farrell, who was making only his second senior start in goal for Leeds in place of the dropped Felix Wiedwald. The 21-year-old denied Jota, Ivan Cavaleiro and Leo Bonatini but was perhaps at fault for Wolves' third goal, racing off his line and allowing Afobe to lift the ball over him from 25 yards. A speculative long-range shot from full-back Gaetano Berardi was the closest Leeds came to a reply as they fell to a second consecutive 3-0 defeat, and they have won only one of their six matches since Paul Heckingbottom took charge in February. 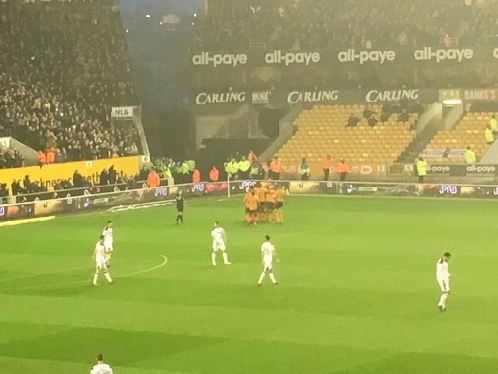 Match ends, Leeds United 0, Wolverhampton Wanderers 3. 90'+3' Second Half ends, Leeds United 0, Wolverhampton Wanderers 3. 74' Goal! Leeds United 0, Wolverhampton Wanderers 3. Benik Afobe (WW) right footed shot from outside the box to the bottom right corner. Assisted by Diogo Jota with a through ball. Second Half begins Leeds United 0, Wolverhampton Wanderers 2. 45' Sub, (LU) Pablo Hernández replaces Hadi Sacko. 45'+4' First Half ends, Leeds United 0, Wolverhampton Wanderers 2. 45'+2' Foul by Willy Boly (WW). 45'+2' Pierre-Michel Lasogga , (LU) wins a free kick in the defensive half. 45'+2' Attempt saved. Pierre-Michel Lasogga , (LU) right footed shot from the right side of the box is saved in the bottom right corner. 45'+1' Foul by Matt Doherty (WW). 45'+1' Hadi Sacko , (LU) wins a free kick on the left wing. Goal! 45' Goal! Leeds United 0, Wolverhampton Wanderers 2. Willy Boly (WW) header from very close range to the centre of the goal following a corner. 45' Danny Batth (WW) hits the bar with a header from very close range. Assisted by Barry Douglas with a cross following a corner. 44' Corner, (WW) Conceded by Vurnon Anita. 42' Attempt missed. Willy Boly (WW) left footed shot from the left side of the six yard box is close, but misses to the left. Assisted by Barry Douglas with a cross following a corner. 42' Corner, (WW) Conceded by Bailey Peacock-Farrell. 42' Attempt saved. Léo Bonatini (WW) left footed shot from the centre of the box is saved in the centre of the goal. Assisted by Alfred N'Diaye with a through ball. 39' Foul by Diogo Jota (WW). 39' Adam Forshaw , (LU) wins a free kick in the defensive half. 38' Foul by Barry Douglas (WW). 38' Samuel Sáiz , (LU) wins a free kick on the right wing. 36' Delay over. They are ready to continue. 36' Sub, (LU) Matthew Pennington replaces Liam Cooper because of an injury. 33' Delay in match Liam Cooper , (LU) because of an injury. 31' Corner, (LU) Conceded by Danny Batth. 30' Léo Bonatini (WW) wins a free kick in the defensive half. 30' Foul by Adam Forshaw , (LU). Goal! 28' Goal! Leeds United 0, Wolverhampton Wanderers 1. Romain Saiss (WW) header from the centre of the box to the bottom right corner. Assisted by Barry Douglas with a cross following a corner. 27' Corner, (WW) Conceded by Gaetano Berardi. Offside, (WW) Danny Batth tries a through ball, but Ivan Cavaleiro is caught offside. 3' Offside, (LU) Stuart Dallas tries a through ball, but Liam Cooper is caught offside. 2' Foul by Danny Batth (WW). 2' Hadi Sacko , (LU) wins a free kick on the left wing. Leeds United boss Paul Heckingbottom could make changes after his side's disappointing 3-0 defeat at Middlesbrough on Friday. Midfielder Adam Forshaw was brought on as a half-time substitute in that game and is likely to come back into the starting XI. Wolves are without midfielder Ruben Neves, who is serving a two-match ban. The leaders have not won any of their past three games - their longest run without a league victory this season. Leeds have alternated between a win and a defeat in their last six home league matches against Wolves - they lost last time out at Elland Road in April 2017. Wolves have not beaten Leeds at Elland Road in back to back league seasons since the 1959/60 campaign. Leeds have conceded 46 league goals this season - they only conceded 47 in the entirety of last season. Wolves have won just three of their last 10 matches in all competitions (D4 L3). The Whites have lost their last five Championship matches against teams starting the day in top spot, since a 1-0 win at Middlesbrough in February 2015. Ivan Cavaleiro has been involved in more Championship goals for Wolves than any other player this season (18, 10 goals and eight assists), including five in his last five games (one goal, four assists).